CFS Machinery CO.,LTD, established in year of 2001, is a leading professional closed die drop forging manufacturer, located in Ningbo, China. Our company specializes in custom all kinds of steel forgings, aluminum forgings and copper forgings involved in mining machinery, construction machinery, automotive components, oil & gas industry, ect. 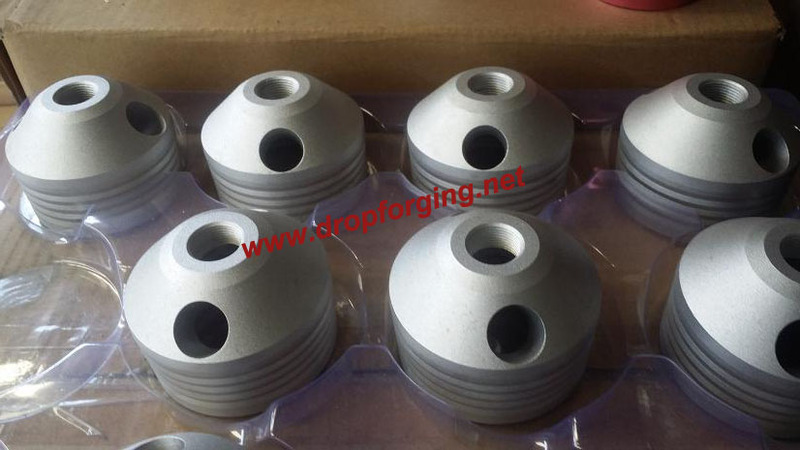 We could serve drop forged components both in conventional closed die forging and precision forging process ranging from 0.05kg-100kgs. In our drop forging factory, there are total 250 staff working here, with 218 workers, 6 engineers, 8 QC men, 10 sellers and 8 administrative staff. We have advanced production and testing equipments. Our production equipments consist of moulding equipments, forging equipments and machining equipments. Besides,we also have our own heat treatment workshop, including normalization, quenching, tempering & hardening, ect. Under the hard-working of all staff, we could reach an annual output 10,000t of drop forgings. 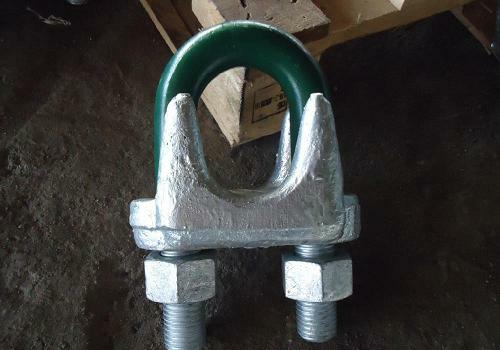 At present, all of our drop forgings are exported to overseas market, like America, UK, Canada, Australia, ect. Our advanced drop forging process, complete production & testing equipments and experienced technical team, all help Fly supplying qualified drop forging products and good service. 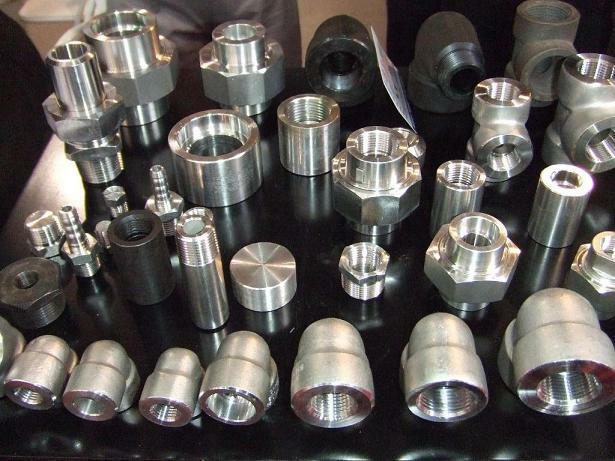 Currently, we are issued with TS16949, API & ISO9001:2008 certifications, lots of customers are turning to our company to produce drop forgings like auto parts, oilfield pipe fittings, foundation drill bits, ect. Today, CFS company continues to enlarge our company's scale to creat a world-class drop forging supplier. We are now also developing robots as the workforce to save labour costs and improve production efficiency. The second most popular aluminum for forging, 6061 is precipitation-hardened and uses magnesium and silicon as its major alloying elements. It was first developed in 1935 as part of the early advances in the aircraft industry. 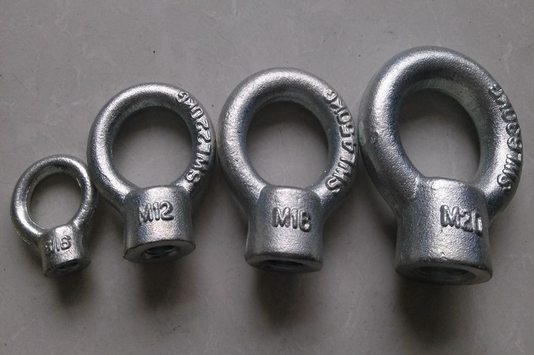 It offers good weldability and machinability, good joining characteristics, accepts applied coatings well, and is highly corrosion resistance while having a high strength to weight ratio. In contrast, 6063 is the most popular aluminum used for forging. It also uses magnesium and silicon as its alloying elements. Its unique properties allow it to be formed into complex shapes with very smooth surfaces, making it fit for anodizing. Its major drawback compared to 6061 is that it does not have the same level of strength. Fly Forge, is one of the most important aluminum forging companies in China for various industries. 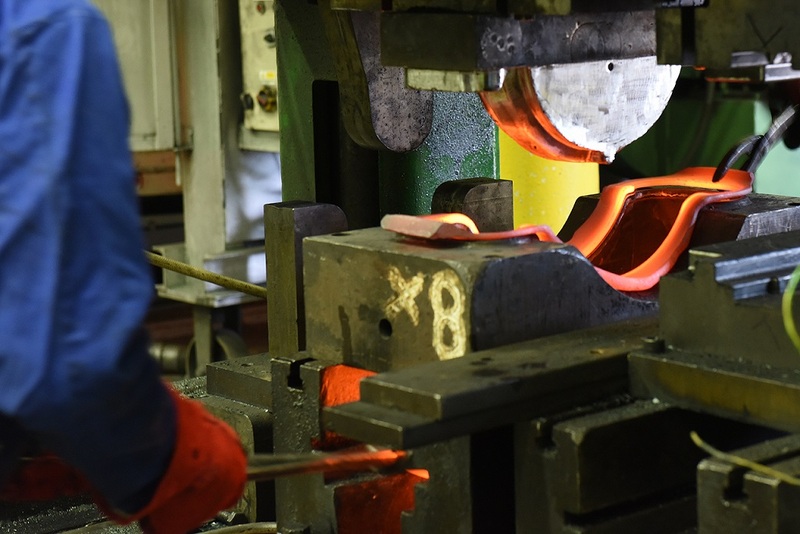 With 9 production facilities in our company, all equipped with state-of-the-art tools and machines, we cover the whole spectrum of forging techniques and provide the complete development of components, from the design to the production. We forge all types of aluminum forgings required. The Employees at Fly Forge are committed to servicing our customers through the entire process, from quoting to receiving our products. Every customer is different, each with their own needs and expectations. We take the time to understand how your business works so that we can exceed your expectation on every order. We want to make sure that when an aluminum forging is needed Fly Forge is the only manufacturer that comes to mind. Skip lugs are the important components to fit these waste containers. 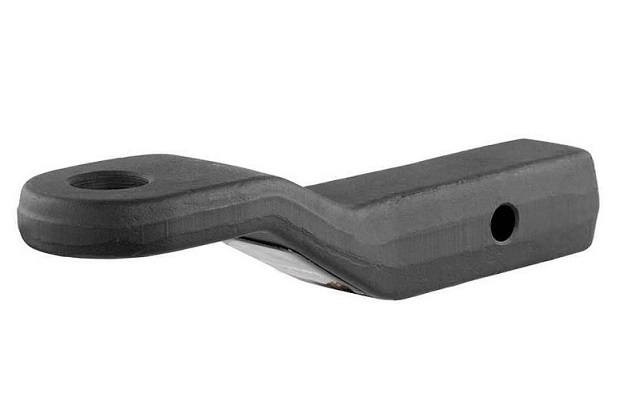 They are designed and produced in closed die drop forging process. 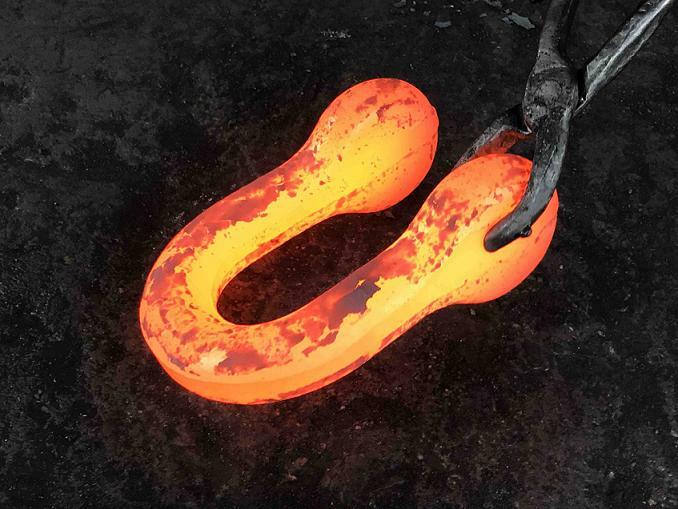 Drop Forging will involve the manipulation of material to achieve a desired skip lug shape, offering a compressed and directional grain flow to produce a stronger and more resilient skip lugs. 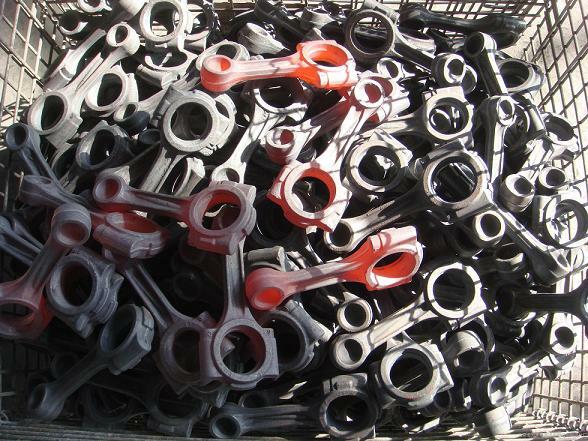 Forge manufactures and supplys a large range of drop forged components for the skip and container refurbishment industry, including Skip Lugs. Ningbo port is the forth largest habour in the world. 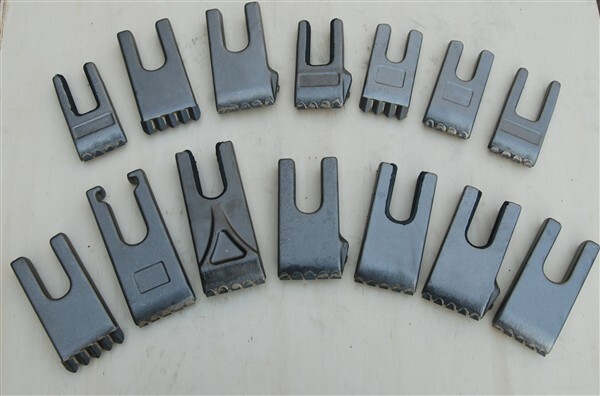 As the largest drop forging company in Ningbo, Fly Forge can deliver high quality drop forged skip lugs with attractive price. Vibratory finishing is a type of mass finishing manufacturing process used to deburr, radius, descale, burnish, clean, and brighten a large number of forgings. 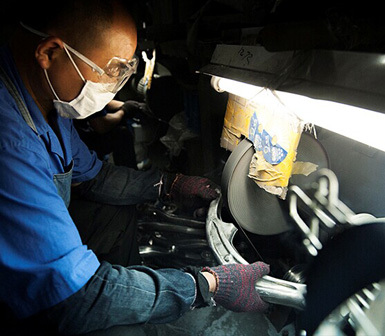 Fly Forge is one of the few forging companies that can provide vibratory polishing service of forgings for our customers in China. 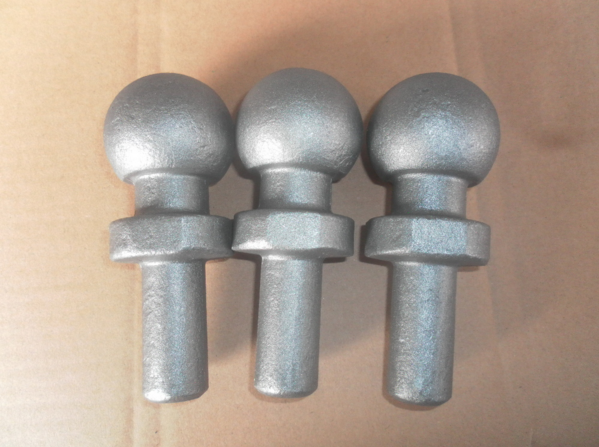 Besides vibratory polishing, we can also other surface treatment services of forgings include shot blasting, powder coating, electropolishing, color painting, ect. 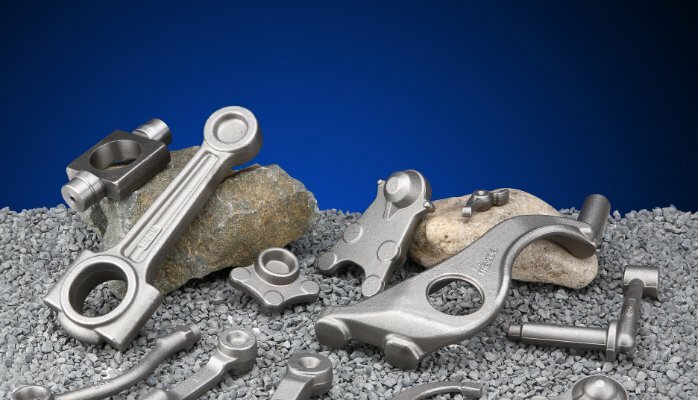 All our forgings serves the agricultural, aerospace, automotive, medical, and construction equipment industries. With a number of beneficial properties, aluminum forging is an easy choice for manufacturing aircraft. Wood was originally used to build aircraft, but it is prone to rot and can splinter without proper maintenance. 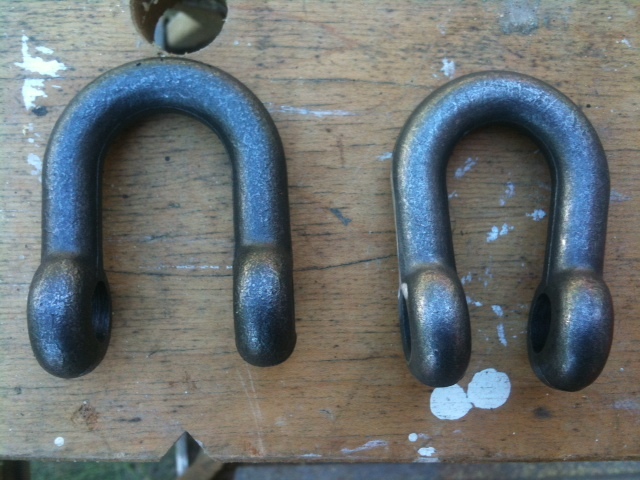 Likewise, steel forging is stronger than aluminum forging, but weighs significantly more. Steel forging is only used in aircraft when extremely high strength is needed, such as landing gears. 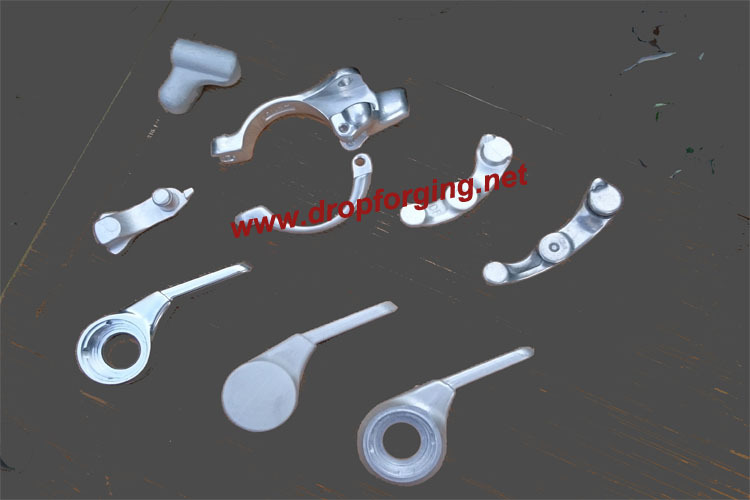 Fly Drop Forge is a leading manufacturer of aluminum forgings in closed die forging process for aerospace application. End use applications include landing gear, engines, structural components, brakes and rotors components. 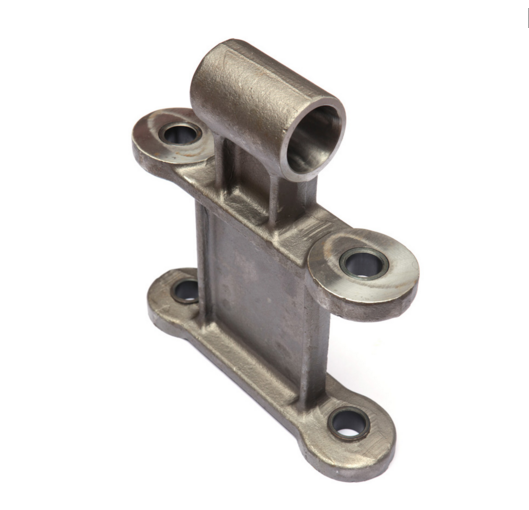 Fly Forge has the experience and expertise in aluminum forgings that ensures the structural durability and high strength-to-weight ratio capabilities needed in a aluminum forged product for aerospace applications. Contact us today to talk about your aluminum forgings needs and how we can get your project done quickly and to your specifications. Closed die forging is not limited to steel components, it can be used to produce aluminum components as well, just different heating methods. 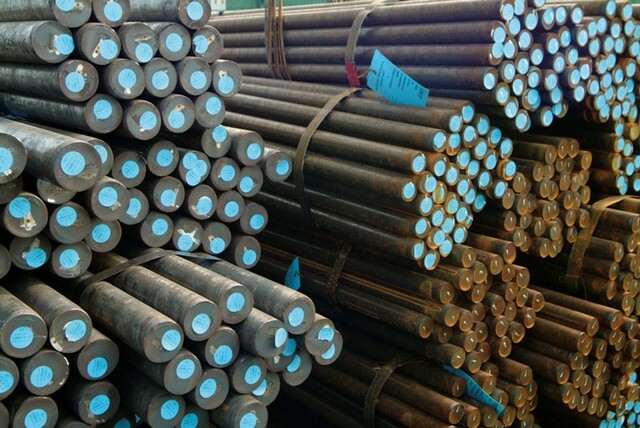 Before forging of aluminum alloys, blanks are cut from round bars, then these aluminum bars are preheated to temperatures in the range of 400° - 500°C, according to the alloy used. 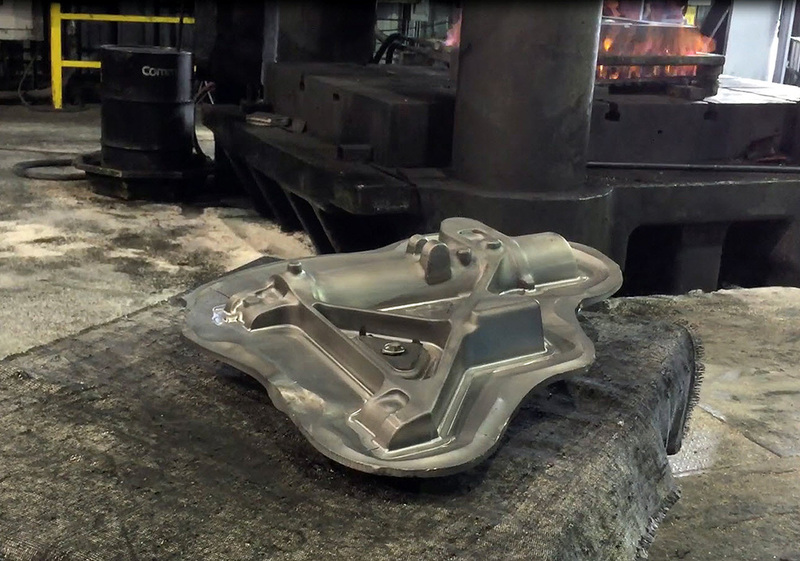 At Fly Forge, our closed die forging process can produce aluminum components in all shapes and sizes required to conform to your specifications. 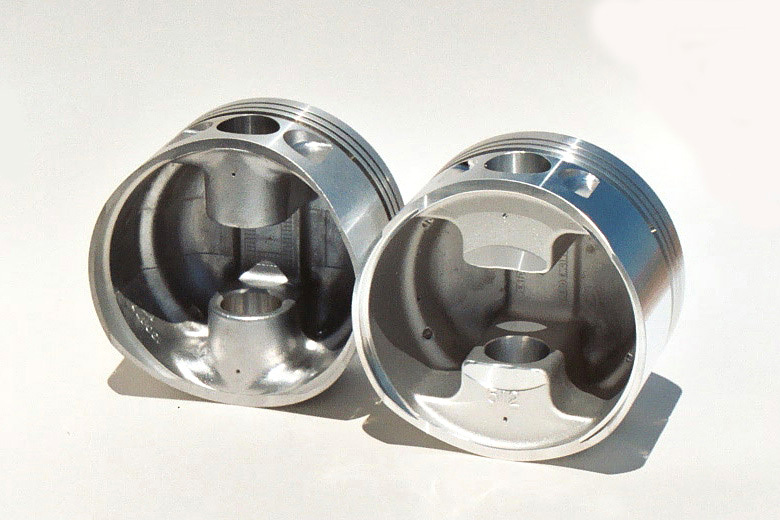 We supply our superb custom-made aluminum forgings to meet our customers' needs and even exceed their expectations. 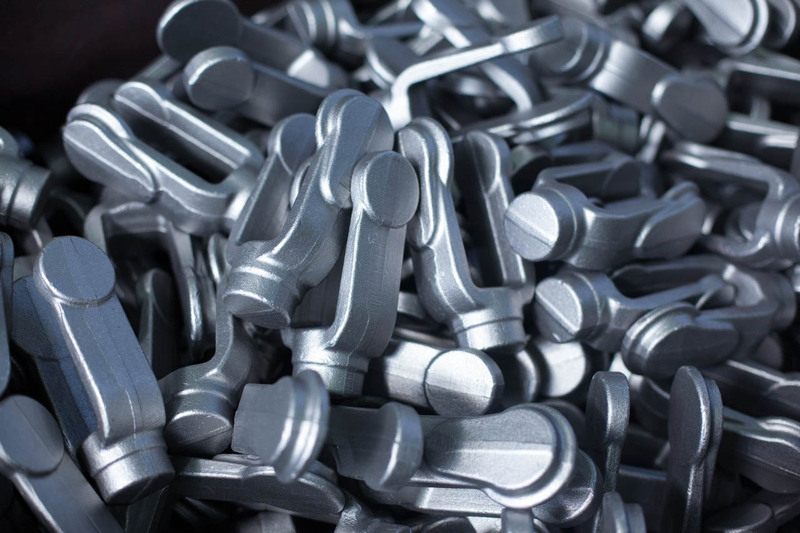 Anodization or Anodizing treatment is the common surface finishing/coating method used for aluminum components, including aluminum castings, aluminum forgings, and even machined aluminum parts. Aluminum forged part is "anodized" for corrosion resistance, improved appearance, hardness & wear resistance, and for a number of specialized reasons like better glue-ability (adhesive bonding) for structural use, improved paint adhesion, and enhanced capacitance in electronic applications.Aluminum forgings are better than castings for anodizing due to a denser, more homogeneous microstructure. 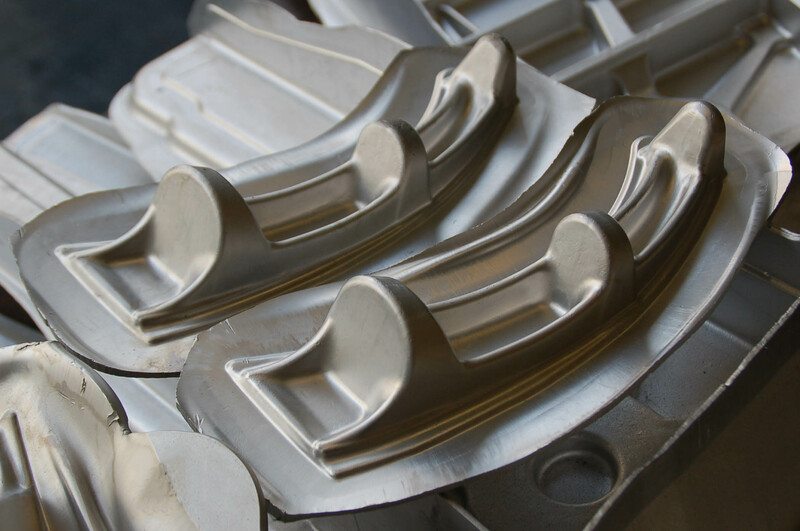 Fly Forge is the leading manufacturer for finished aluminum forgings, including closed die forging, cnc machining, surface finishing, heat treatment. So we can also deal with aluminum forgings that require further anodization. 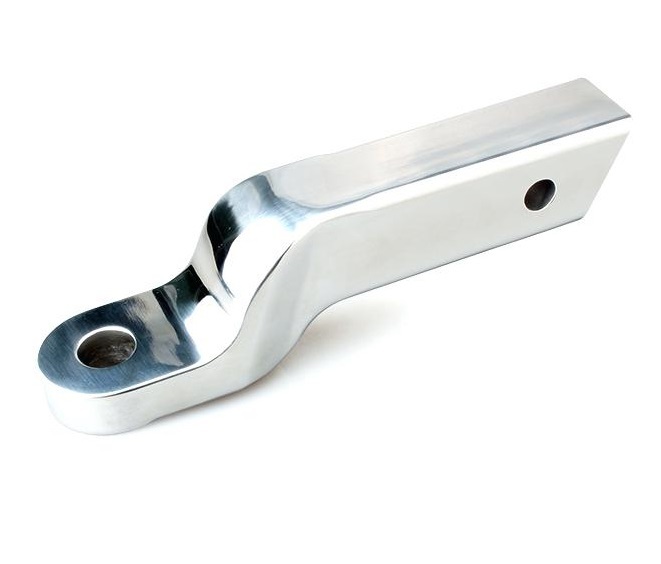 So, in order to reduce the weight of the product and protect the environment, many metal components are converted into aluminum forging with hard anodizing treatment, which were originally produced in steel forgings with hard chrome plating. Like Chinese others' industries, the lack of forging technical engineers and workers is getting more serious caused by the rapid econimic expansion in China. 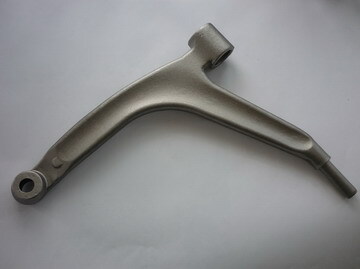 To relieve this problem, so some Chinese forging companies like Fly Forge have gradually invested some automatic production lines to ensure normal production.In general, China’s forging industry is progressing in the direction of providing complete solutions that integrate materials technology, forming technology and post-processing. When forged and heat treated, aluminum forgings exhibit some mechanical properties comparable with seel forgings. The strength to weight ratio is therefore far superior. 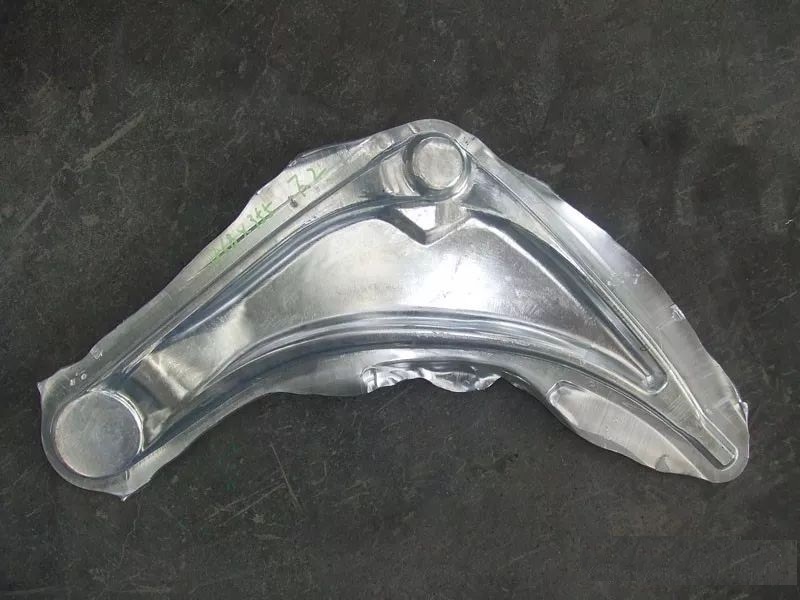 For example, the 2014-T6 aluminum forging has a typical UTS of 485MPa, exceeding that of many grades of steel forgings, and all commonly used aluminum castings. 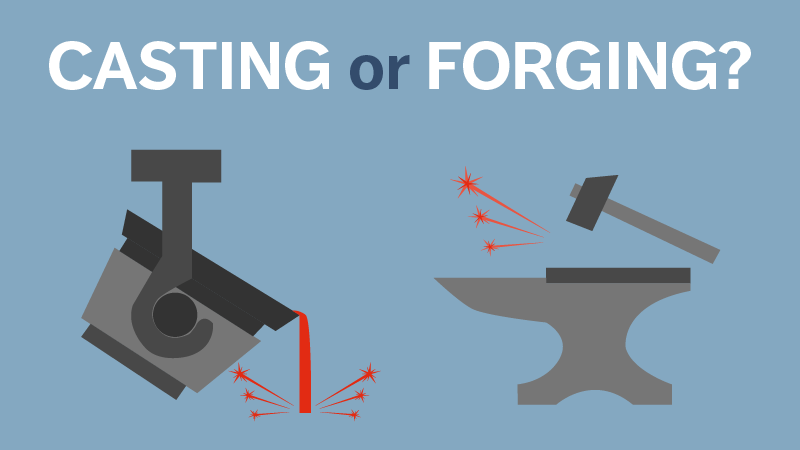 Unlike casting, forging is always porosity free (forging vs casting) thus allowing relatively straight forward heat treatment processes that significantly improve selected mechanical characteristics. 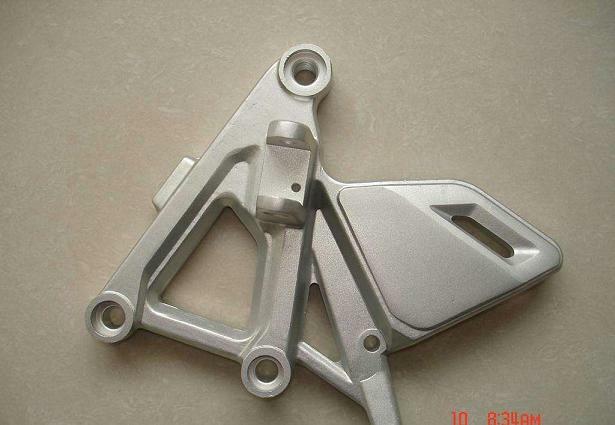 The lower cost 6061 aluminum forging attains typical values of 310MPa, which is also superior to, for example, A356 (or 601 type) aluminum casting whether that alloy is semi-solid cast, squeeze cast or gravity cast. Further fabrication by welding is also available with 6061 aluminium, allowing it available for many other applications. Closed die forging is a process by which a billet of simple cross section is plastically deformed by applying compressive forces through dies or tools to obtain a more complex shape. 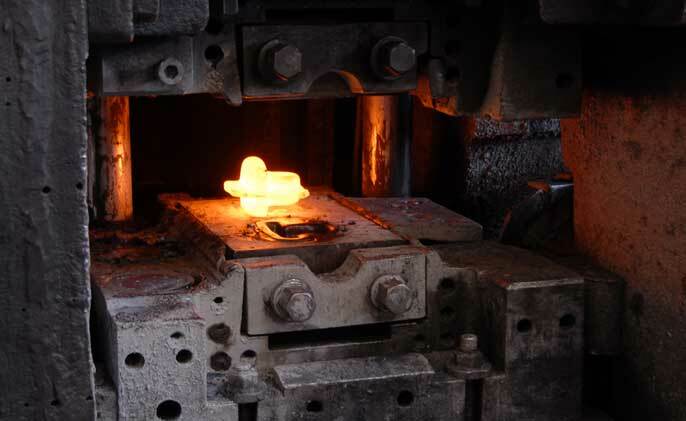 In closed die forging, two or more dies are moved toward other to form a metal billet that is heated to the appropriate forging temperature. 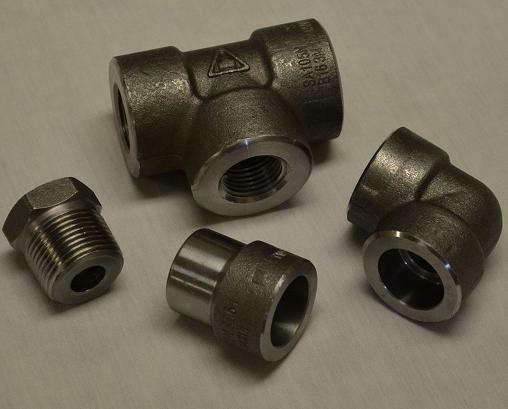 This process is capable of producing components of high quality at moderate cost. 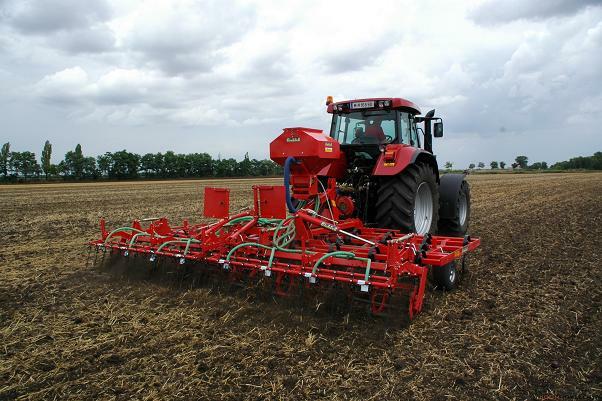 It offers a high strength-toweight ratio, toughness, and resistance to impact and fatigue. 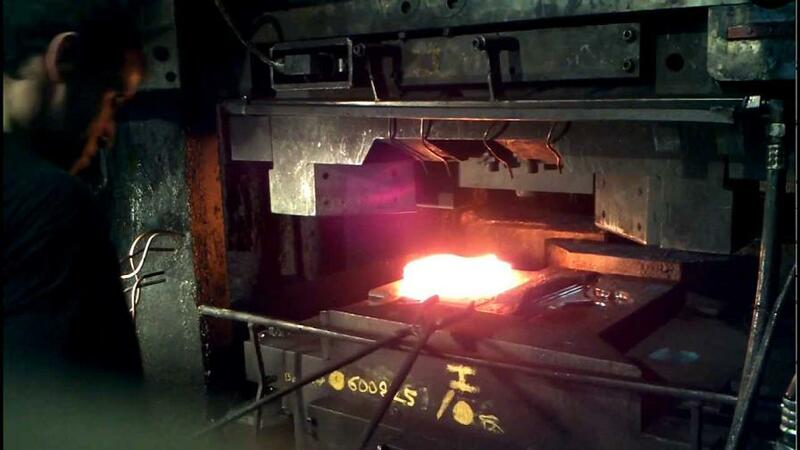 This forging technique allows us to produce lots of metal components with critical safety consideration. Closed die forgings could be served for components in automobile/automotive industry and in aircraft, railroad, and mining equipment. And, marine industry is also one of the main field that closed die forging involves in. 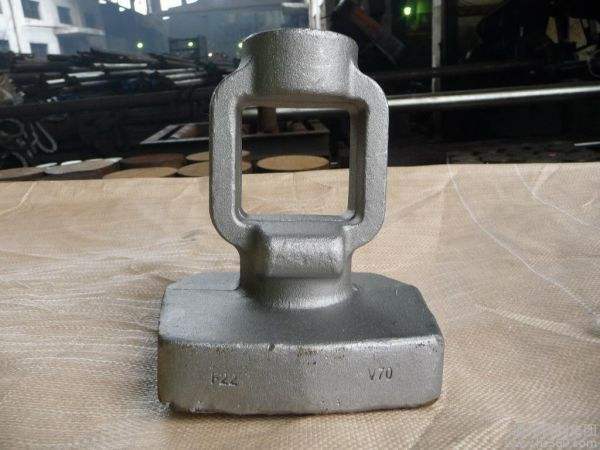 At Fly Forge, we are considered as a world class supplier of marine forgings in China, and we pride ourselves in supplying quality products with lowest costs. Pls contact us while you have such needs. Were you able to find a good source for forging? You may find out there are very few Chinese manufacturers that could satisfy your companies' needs. We are a Chinese company with our own tooling & forging factory in Ningbo China. 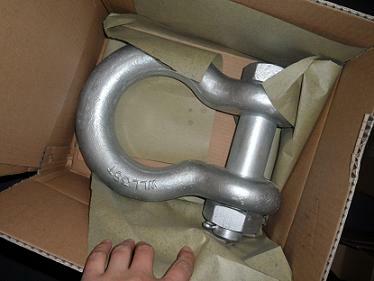 We build very precise and high quality forgings exclusively for demanding US, Canada, UK, Germany, Italy and more companies. We have very advanced equipments in house. 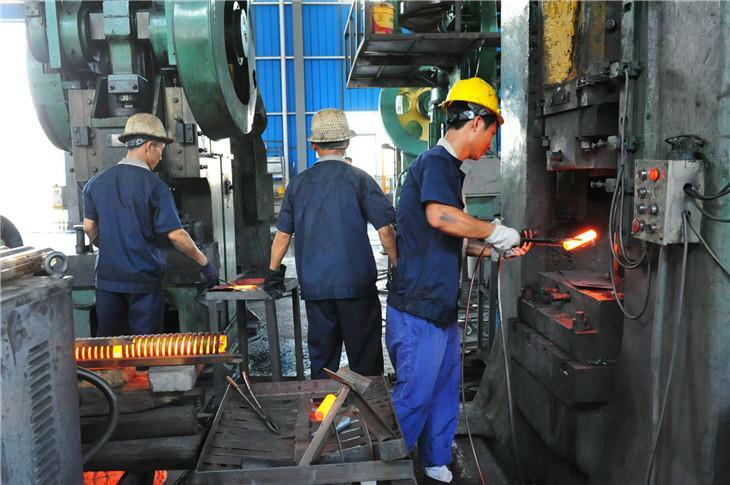 Our forging engineers are good at English and forging technologies, so our company is easy to communicate with. Feel free to let us know if you are finding a forging supplier in China. We are a unique hybrid solution of dealing with an American companies but getting better Chinese prices. We will be glad to review your specifications and share them with our plastic injection mold makers as well for their input. We work on a cost plus basis, we will give a very honest quotation to build what exactly you are expecting. 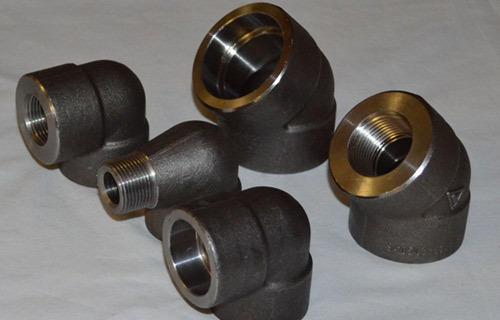 We have a reputation for making only top quality forgings and we stand behind our work. We think you will really like working with our company. To defend countries, the military must constantly develop new defense technology and equipment that performs on and off the field. 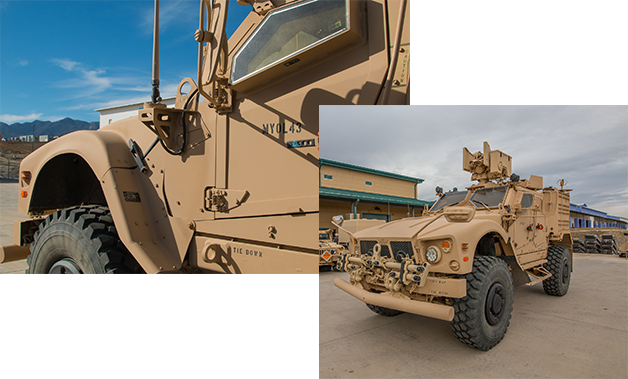 From Humvees and tanks to jets and satellites, military technology is more advanced than ever before, requiring detailed machinery consisting of extremely precise parts. 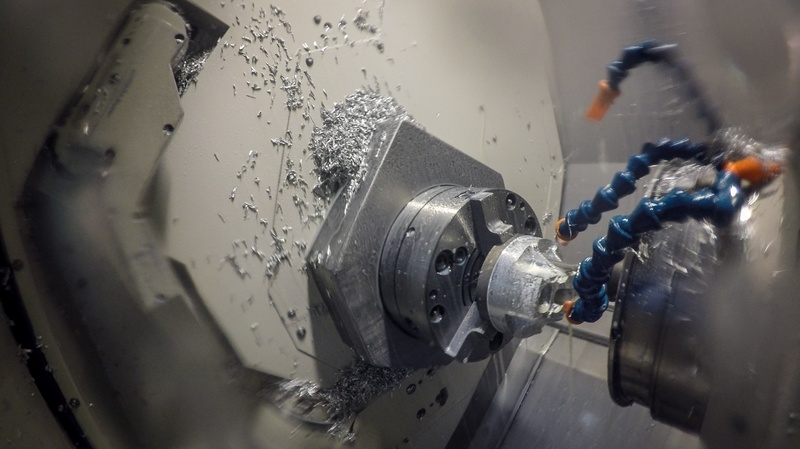 To keep existing machines running properly and to help design and prototype the military machines of the future, the military organizations use only the best manufacturing processes on the market to produce their parts and prototypes. One of these processes is forging. 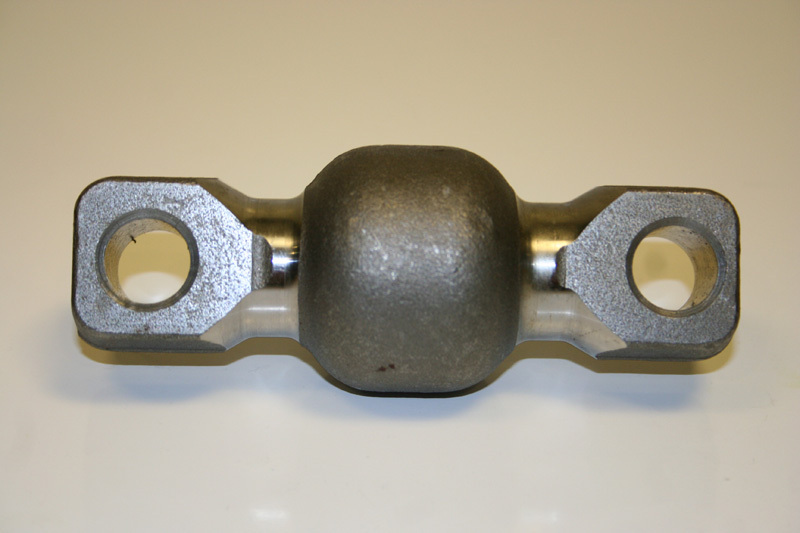 Fly Forge can customize all kinds of different hitch balls for your trailer application. 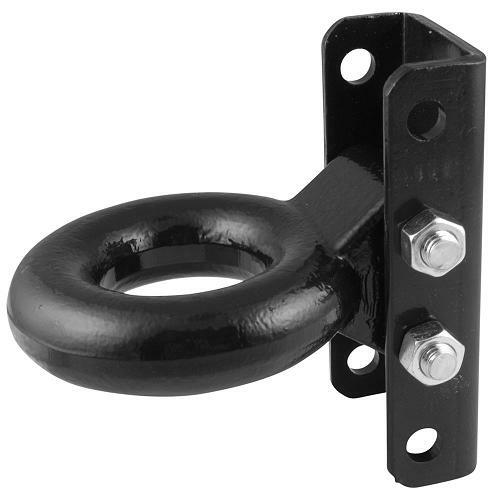 Such hitch balls can be made in carbon steel, stainless steel and other steel materials. Our company can provide the service from tooling design, parts manufacturing to testing & package. With advanced production process, the quality from our factory is always guaranteed. 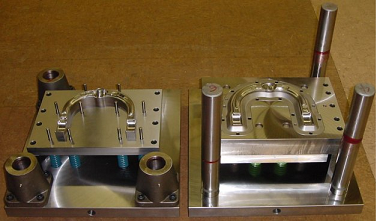 With in house tooling and machining, we can supply qualified products in competitve prices. With the most commonly used method, the billet is heated and placed into a special kind of tooling called a 'die'. The heated metal is put under extreme pressure and forced into the shape of the 'die'. Unlike the 'cut' that it once came from, the grain flow is directional and has been orientated in a way to increase strength/toughness (i.e increases steel ductility and impact resistance). 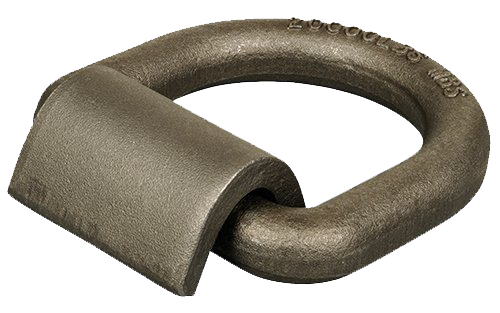 Also, as no grain ends are exposed, a forged item is less susceptible to fatigue and stress. 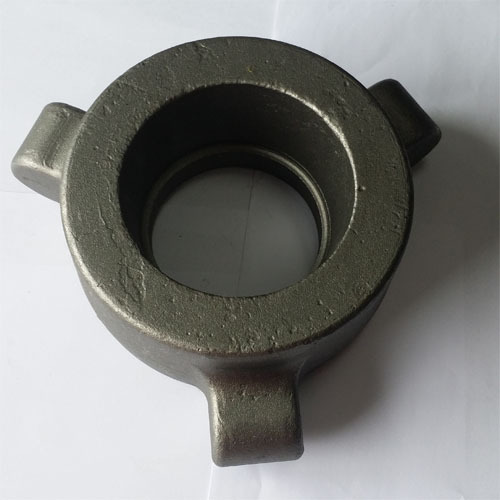 Today steel forging and steel casting have been the two main production processes for steel parts.Compare to steel casting,there are a lot of advantages to use steel forging as the metal forming process. 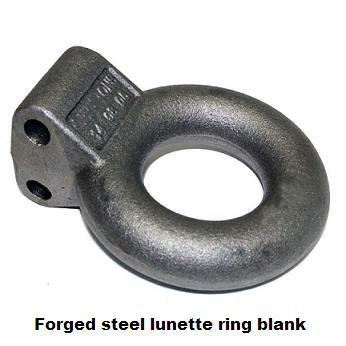 When pressing the heated steel billet between forging dies,steel will fill the die cavity and the redundant steel will be around the shape of product,which is called flash.So the waste of whole forging process is the flash.That is why steel forging is a net or near net shape process compare to steel casting.Also,although the cost of forging dies are higher than that of casting molds,but the unit cost of steel forging is much lower than steel casting.So in terms of cost,when the quantity is large,steel forging is more cost-effective. 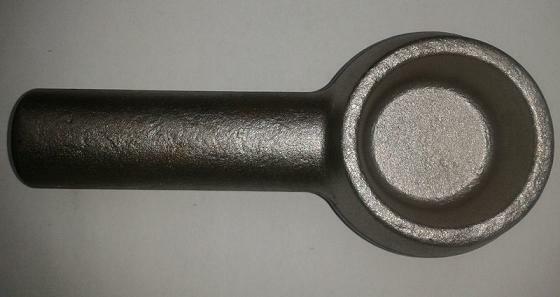 When you finish the design for a metal part,you can choose both casting and forging for it(see differences between forging and casting).But if you would like to customize it in a large quantity,low cost,close tolerance,high strength and short lead time,closed die forging technology is the best choice for you. Closed die forging can be made in different metals,such as forged steel,aluminum,brass,ect.The select of material will mainy depond on the application of its industry.At Fly Forge,we can take any design and metal into production with our advanced closed die forging process.And forged steel is the most common used material by our customer for its special characristics. Forging dies manufacturing is the first step to start a forging part.We all know that forging can be generally classified into two types,open die forging and closed die forging.Open die forging is operated between flat dies or dies in a simple shape.This process is mainly used for large parts.In closed die forging,metal billet is deformed in upper and lower dies for desired shape and dimensions.Deformation occurs in the closed cavity under high pressures,which will achieve precision forgings with tight tolerances.So this process is widely used for the manufacture of simple as well as complex high strength precision parts,especially when safety factor is considered.As a closed die drop forging manufacturer,we would like to introduce the forging dies manufacturing for closed die forging parts in detail. 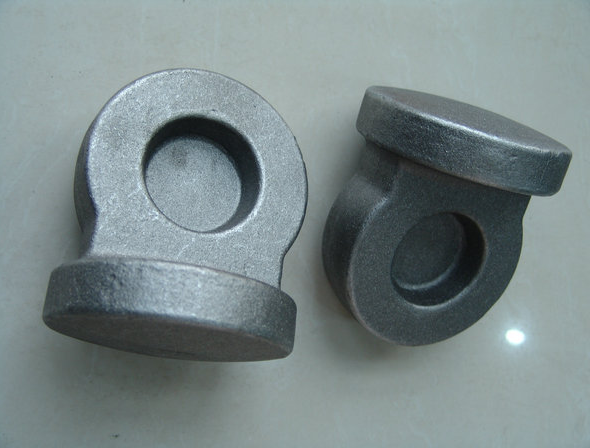 Before manufacturing of forging dies,we can not start the production process directly.Firstly,engineer need to know how to design the forging dies following the drawing of a new forging part.Design of forgings dies depends on the processing steps,nature of workpiece material,flow stress,working temperature,ect.All these factors need to be considered.Generally speaking,we need to calculate the volume of billet accurately to aviod under filling or excess filling.And selection of parting line(referring the lind where two dies meet) is also important.Sometimes for a forging part,there are several options to choose a parting line.And the best one is that the parting line can ensure the flow of material will be uniformly divided.In other words,forging is not feasible if there is no way to decide parting line,in this case,casting can be considered. Forging is processing way that putting pressure on metal blank by forging machinery, making it produce plastic deformation, in order to obtain certain mechanical properties, a certain shape and size of forgings. Forging can eliminate the as-cast osteoporosis of the metal, welded holes, and generally mechanical properties of forging is better than that of the same material of the casting.So for those important components that require to undertake high mechanical load, or working in serious conditions, in addition to simple shape rolling plate, or welding parts are available, all will consider forging process. Casting is a metal forming process that melting the metal into certain requirements of the liquid and then pouring it into the mold,after cooling solidification,we can get desired shape and sizes.Production cost of blanks produced by casting is low.For complex shape, especially the parts with complex inner cavity, casting can show its economical efficiency more; At the same time, it has a wide adaptability,and has better comprehensive mechanical properties. But materials that needed in casting production and equipments (such as metallurgical furnace,sand mixing machine,molding machine, core making machine, shakeout machine, shot blasting machine, etc.) will produce dust, harmful gas and noise.Thus it will do harm to environmental. 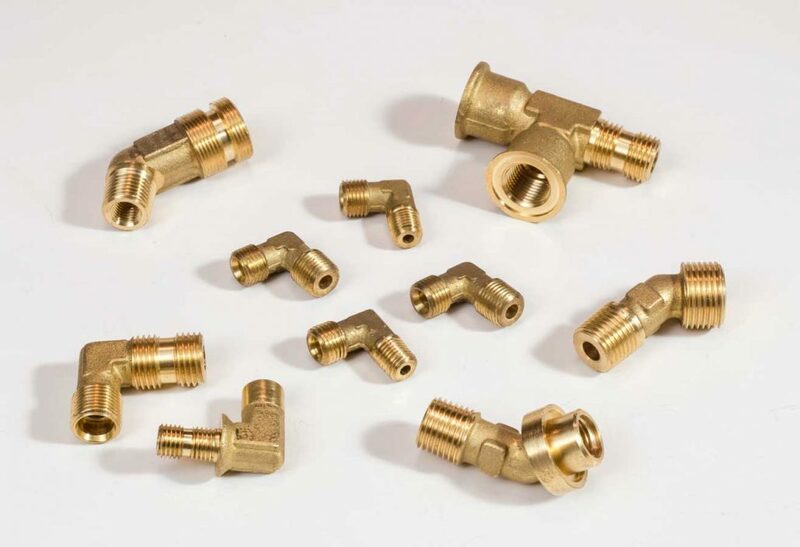 Casting is the oldest metal processing process that first melting metals into liquid status, then pouring metal liquid in injection moulds, and cooling a while to obtain the required shape or dimensions. 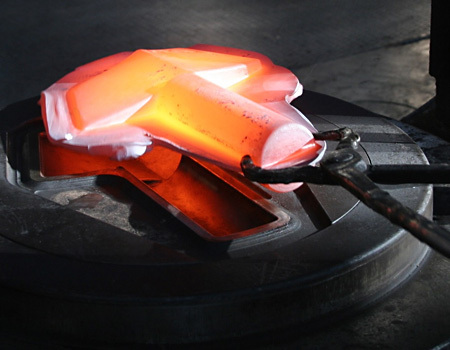 When products are not suitable for forging, casting is the economic method for blank shape. 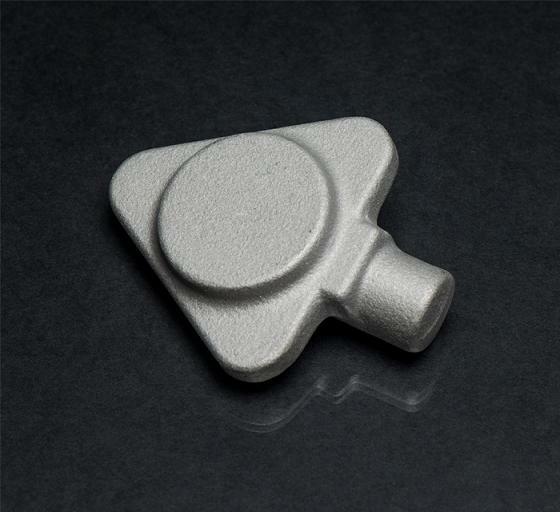 Especially for complex shape parts, casting can show its efficiency more. 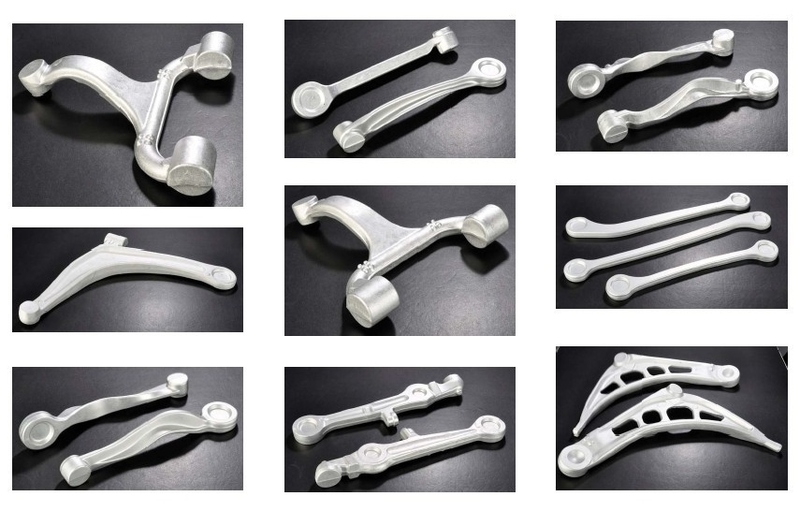 Size and weight range of casting parts is very wide, almost unlimited metal species; Parts that have general mechanical properties, but also has comprehensive performance like wear-resisting, corrosion resistance, shock absorption, which is better than other metal forming methods, such as forging, rolling, welding, punching, etc. 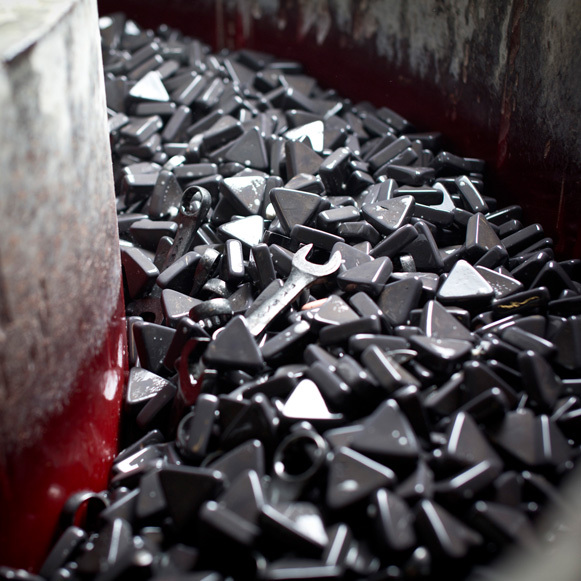 So metal blanks produced by the method of casting process are still the most on the quantity and tonnage so far. Forging is a metal processing process that using forging pressure machines to put pressure on metal blank,which will produce plastic deformation in order to obtain certain mechanical properties,a certain shape and dimensions.Forging can eliminate the as-cast loose defects that produced on metal smelting process,optimizing the microstructure,and meanwhile can preserve intact metal flow.So mechanical properties of forgings generally are better than that of the same material castings. 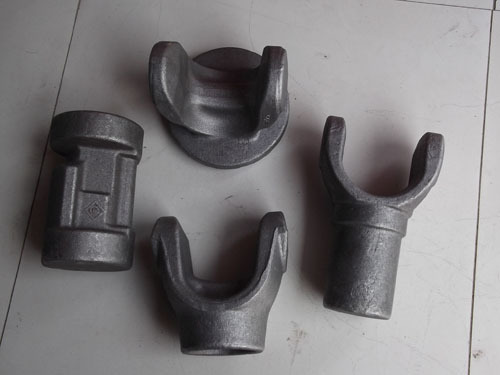 As one of the main metal processing process,applications of forgings are so wide.Such forgings are mostly used by people when safety factor is considered and good mechanical properties are needed.So forgings can be used in mining machinery(mining drill bits),agricultural machinery(agricultural wear parts),forestry machinery(mulcher hammer/teeth),automotive industry,trailer parts,ect.Click our photo gallery page can help you to learn more about forging applications. "I would like to buy an Orsi 209 flail mover delivered with Y knives blades,but I preferred flail hammer blades. I'm just puzzlled which one is more suitable. I want to promote good pasture health in the paddocka,but also a nice finish on my lawn areas around the house.The flail mover will also be used for clearing of regrowth where there is a strong possibility of hitting tree stumps and branches, and small and large rocks. It will be much appreciated if any experience or opinions are provided." 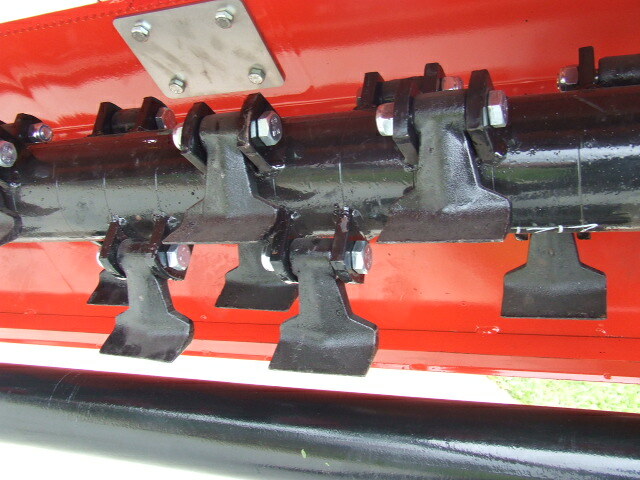 When you design o buy a new flail mower, you will have a choice of the Y Knife Blades or Hammer Blades. The Y-Blades are great when cutting tall weeds and overgrowth and can also offer a nice cut to your lawn. 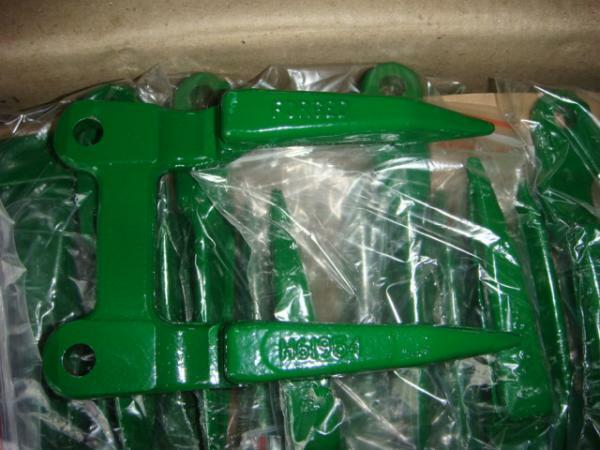 However,if you are need to cut tree saplings and dense overgrowth,the flail hammer blades are used,which are wider, heavier blades than the Y-blades. 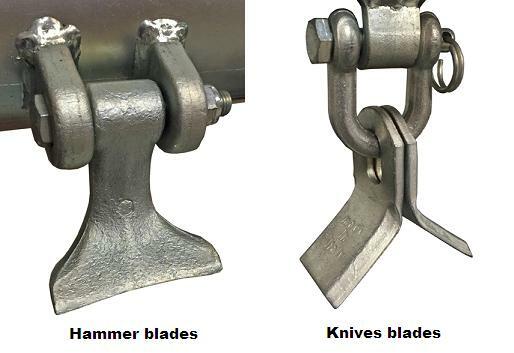 No matter Flail hammer blades or Y knife blades,either set of blades will make a perfect solution for cutting. 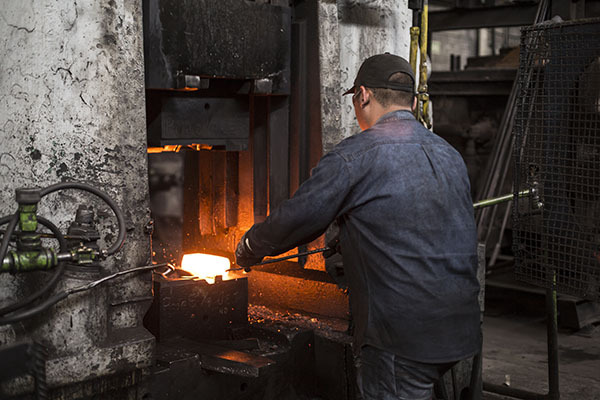 In forging industry,there are some professional terms which are defined to describe the forging process or operations.Below we picked out some common terms when used in closed die forging process. 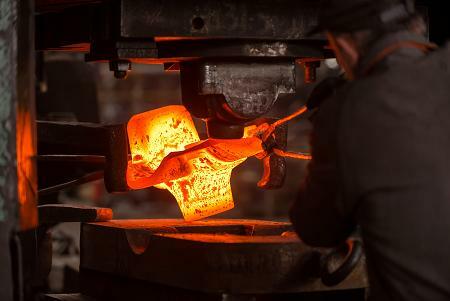 1)Forging die:It may be referred to a complete tool consists of a pair of mating members for producing work by hammer or press.A pair of forging dies consists of upper and lower die halves with cavities. 2)Billet:A slug cut from rod ready to be heated and forged. 3)Blocker:Preform die or impression,used when part cannot be made in a single operation. When purchasers need a metal forming process for their precision design or products,they may have lots of considerations,such as quality,economy,ect.With the development of modern industry,there are all kinds of metalworking processes for choosing,such as casting,forging,powder metallurgy,stamping,machining,ect.Each metalworking process offers a unique set of costs,advantages and capabilities.When safty and strength factors are required,closed die forging process will be your best choice.In fact,closed die forging is often the optimum process,in terms of both part quality and cost-efficiency-especially for applications that require maximum part strength,special sizes or critical performance specifications. 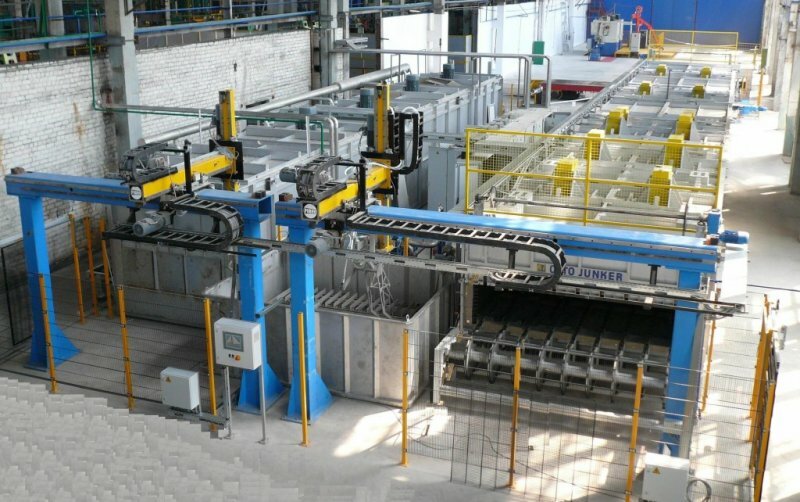 In fact,in terms of forging,there are also several kinds of forging processes available,such as open die forging,closed die forging,cold forging,and extrusion.However,here we will discuss the methods,application and bennefits of closed die forging process.We suggest you to consider this process when selecting the optimum process for your metal parts production. 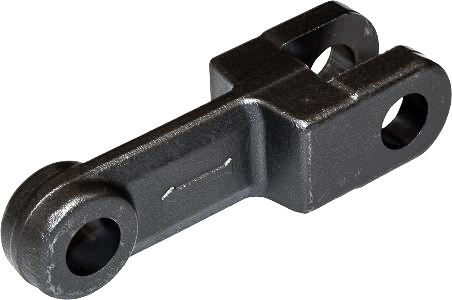 Closed die forging is commonly used in nowadays for many improtant metal components.On one hand,is that it can product metal products with good properties.On the other hand,the price of closed die forging is also competitive than casting.In other words,closed die forging also has economic advantages. 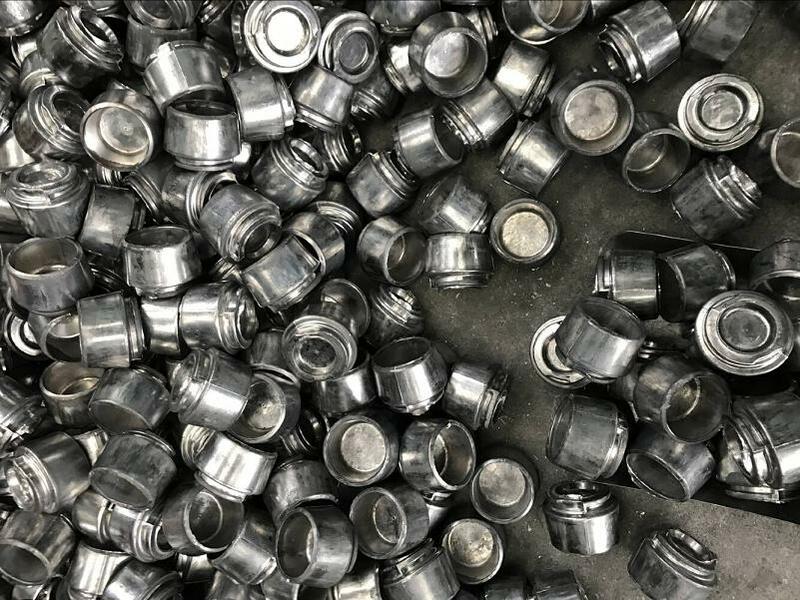 Before forging,we will first need to cut the equal billet according to the size of products.Normally,the waste of material after forging is the flash.So comparing with casting or machining,closed die forging requires less material,thus material cost will be saved.Take a round ring for example,we can make it by forging or machining.If machining,the all corner and the center material will be wasted.But with forging,we can forged to the sizes with minimum waste. Linear dimension,or size,it is to point to the distance between two points,such as diameter,radius,depth,width and height,center distance,etc.To express the dimensions of drop forgings exactly,lots of linear dimensions will be show in a drawing.After finish production of products,we will test all these linear dimensions by vernier caliper or digital caliper,to check if these dimensions are within the required tolerances.For outer diameter,it will be more accurate to use outside micrometers. Angular dimensions are usually shown the size of Angle,like 30,such angular is tested by universal bevel protractor. 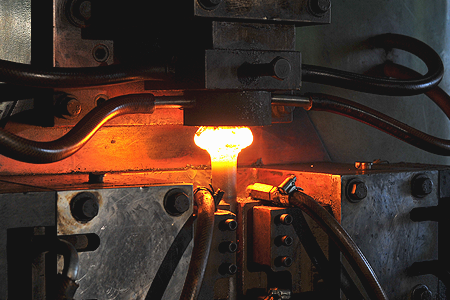 To remove the stress and improve mechanical properties of drop forging, heat treatment will be done after forging. Such heat treatment can be normalization, tempering, quenching, temperting&hardening,ect.To test the heat treatment result,we may test the tensile strength,yield stength,enlongation,hardness,among these mechanical properties,hardness test is usually used for drop forging.Today,we will introduce common hardness testing methods for closed die drop forging. Both briness hardness and rockwell hardness are all the testing standard for drop forging hardness.Although the testing methods of them are not the same.But either of them can be adapted to see the hardness result of drop forging products.To ensure correct testing result,for one drop forging product,we should testing the hardness in different sections and check if heat treatment of drop forging is done in a good way. Work with Our Company for Drop Forging? 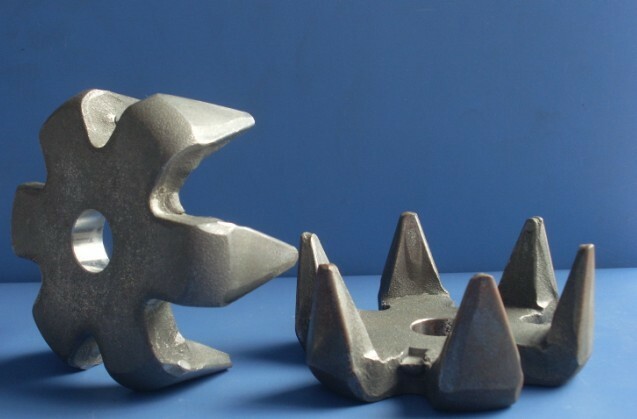 Although the cost of drop forging dies may be relatively high,for piece price,it is very cost-effective.With drop forging process,the metal products can not only be in a low cost,but also win tough and durable characteristics.So that is why people say drop forging has low recurring cost and is the most beneficial production method for long runs.Of course,small quantities can be also offered,but more economocal with increased volume.Compared to cast or machined process,drop forging can produce metal products with a high strength-to-weight ratio.Also,it has less chance of flaws and low injection rate. 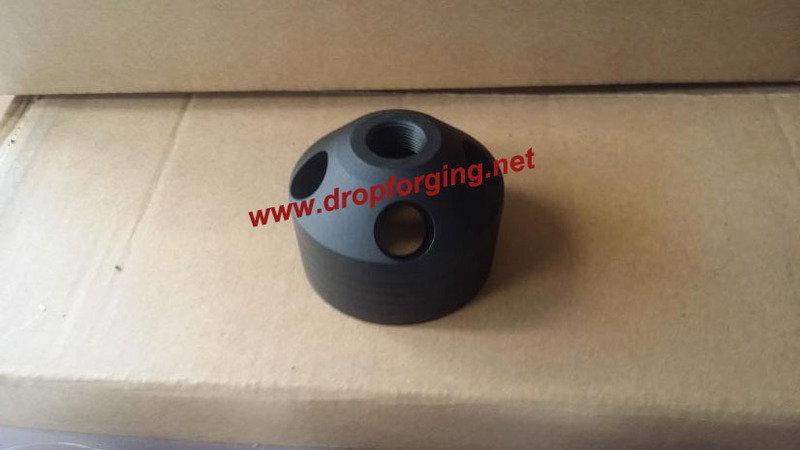 So,when you are interested in sourcing for drop forging supplier.Fly Forge can be your one stop shop.Our quick turnaround times and impressed services are the best in drop forging industry. Steel forging is a metal forming process of shaping metals using the compressive force.The steel forging process is a bifurcated depending on the temperature at which it is preformed.Steel forging helps in shaping of the molten metal onto desired shape and size.It is one of the essiontial techniques in industry that are majorly reliant on machineries.Steel forging has gone simpler with the time.Main classifications of steel forging are carbon steel forging,alloy steel forging,stainless steel forging. The traditional ways of steel forging lacks in various aspects.From being low on durability to prone to corrosion,there are numerous drawbacks.Metal enforced with steel can go a long way in terms of durability and evading corrsion.Closed die forgings for precison components are high on tensile strength.The imposed metals are used in the forging process of disc and sleeves that make cost conscious and quality product. Now there are 7 production lines of closed die drop forging in our factory with forging presses ranging from 300t to 2500t.All these forging presses can be used to forge products in different dimensions.From the point of most people's view,the tooling cost of drop forging is higher than casting tooling.It is without doubt that forging cost more due to its nature and advantages.But in spite of this,you get what you pay,it is rewarding.Our production capabilities are not limited to drop forging,but also machining is also one of our advantages.To serve our customers better,we are also equiped with some machining equipments from drilling machine to CNC,so that machining can be done in our company. Besides,our in-house heat treatment will also help us to offer you our competitive prices.So comparing with other forging factories and trading compaines,we are always your top and wide choice for drop forging products.Any interest in such process,just pls contact us! As a professional closed die forging company in China,we are equipped with seven closed die forging production lines for the requirements of different shape products,that is why we can customize closed die forgings for all the industry applications. 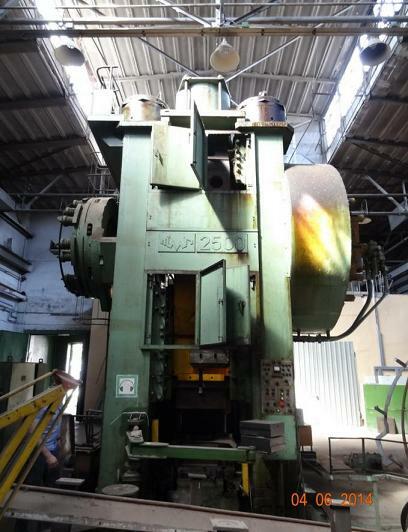 In our forging workshop,forging equipment for each production line is different,currently,we have forging presses in 300t,400t,600t,1000t,1250t,1600t,2500t.Forging presses with larger tons are used for closed die forgings in large shapes&dimensions.Also production steps may be varied from the shapes of products.For shaft type products,steps of closed die forging process are just five,that is cutting billets,heating by medium frequency furnace,drop forged by forging press,trimming by punching machine,last step is shot blasting.Thus,we will see a forged shaft product is finished,such shaft type product is the most simple way to make. 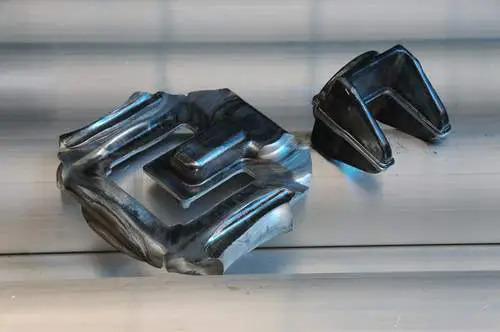 Closed die forging is a form of impression die forging that uses two or more dies.It does not depend on flash formation to completely fill the die.Material is formed in a cavity that allows little or no escape of excess material, thus placing greater demands on die design. 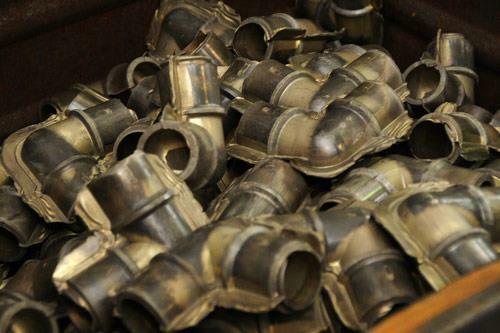 More elaborate die designs provide for more complex shapes than the open-die forging process. 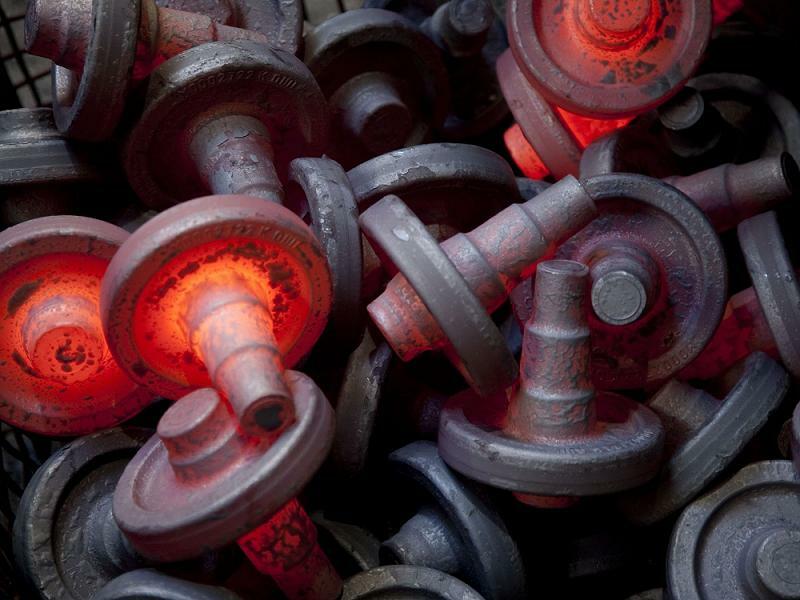 A variety of metals and alloys cans be forged using closed die forging process. 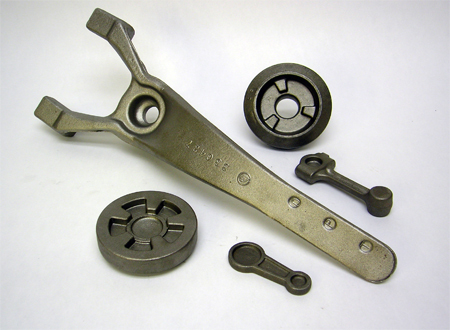 Closed Die Forging is largely focused on extremely high quality applications.Closed die forged materials are required where strength,reliability and resistance to fatigue are top most considerations.As such,forged materials are found throughout the automotive,aerospace and defense industries. Before placing an order,you will first get several quotations from potential closed die forging suppliers,some are manufacturers and some are trading companies.Importing closed die forging from China has been a popular trend for clients for its price advantage.And it has been too easy for purchasing manager with the sign-off to pick the "cheapest"
What we would like to remind you is that it will be a big mistake if just choose your closed die forging supplier who provides you the cheapest quotation.Just as a Chinese going says:"You get what you pay for".For distance factor,foreign customers can only find closed die forging suppliers from search engine.It is not actual for them to visit the potential suppliers right away for high travel expense.So quotation is the most direct factor they can consider a supplier.As a closed die forging company,we suggest more consideration factors,for example,if the supplier is manufacturer or not,what the capabilities are,lead time,ect.All these factors will help you to choose a most suitable supplier in a comprehensive way.Well because that's what we have here and if we quote a customer for closed die forging,we must make it work and work to the best of it's ability for it to be a profitable and sustainable project. 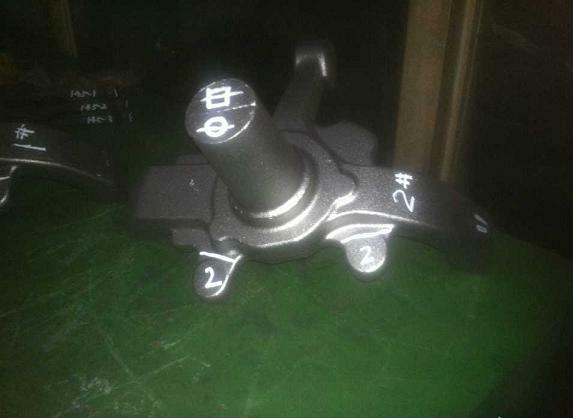 Although closed die forging can produce the strongest steel parts and other advantages,there are only few closed die forging factories in China for its less application than casting.So lacking a good supplier for closed die forging parts has become a common problem for foreign clients.Today a customer from Australia contacted and told us that he is a forging distributor and as now they are getting more and more enquiries for these small closed die forging(mould forging) parts,but they do not have a good supplier.So they are in urgent to find such a supplier. Were you able to find a good source for closed die forging parts? You may find out there are very few Chinese manufacturers that could satisfy your companies' needs. We are a Chinese company with our own forging factory in Ningbo China.We build very precise and high quality closed die forging parts exclusively for companies from US, Canada, UK, Germany,Italy etc.As a China Closed Die Forging Maker,We have very good equipment including forging equipments from 300t-1600t,machining workshop for forging dies and forging machining.Our forging engineers are good at English and forging technologies,so our company is easy to communicate with. Feel free to let us know if you are finding a closed die forging supplier in China. Are Closed Die Forgings Expensive? Closed die forging is a metal forging tecnology for precision parts. Such process is usually considered especially for safty factor because of its good performance and strength. 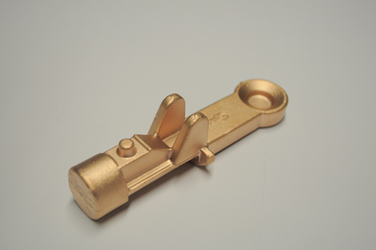 So closed die forging is quite popular in producing automotive and non-automotive sectors. And we can see a lots of closed die forging factories in different scales all over the world, some are for steel forgings, some for aluminum forgings, and others are for copper forgings. 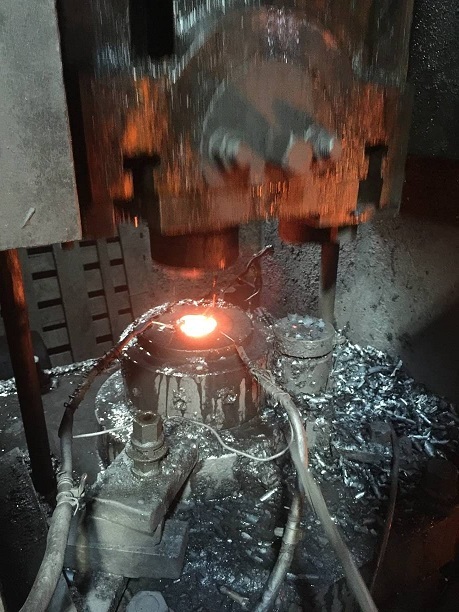 There is no doubt that advantages of closed die forging over investment casting are obvious, so many people may put forward a question: "Are closed die forgings expensive?" Why Choose Closed Die Forging? 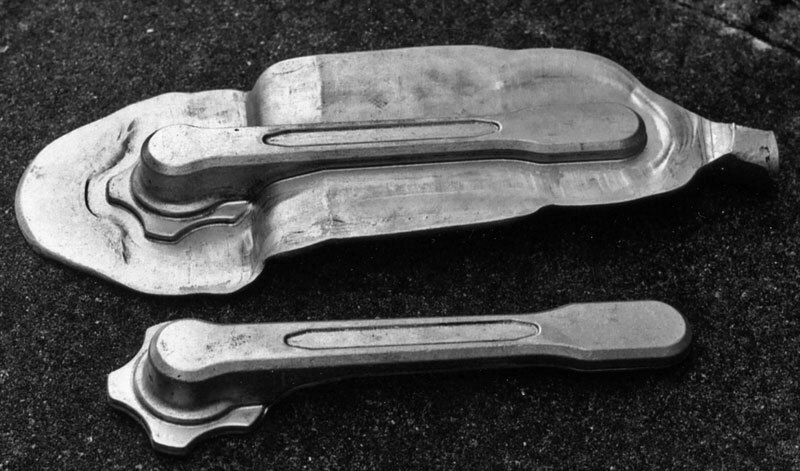 Closed die forging requires two or more dies for production, which are also referred to as tooling. 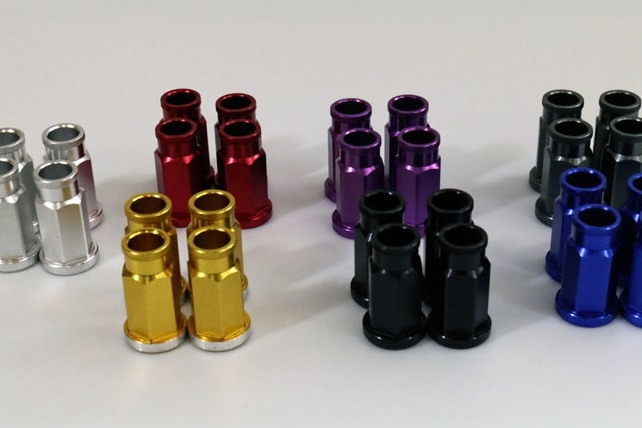 These dies first must be manufactured with CNC machine to reach high accuracy. The billet will be heated up to proper temperature for well deformation and is then pressed or hammered between these dies. The restriction of the metal flow inside the dies allows the production of parts that are more complex in shape than a part being produced by the open die process. Additionally, closed die forging process allows for closer tolerances than those produced in open die (see the difference between open die forigng and closed die forging). Relatively simple shapes can also be processed this way, but the decision is usually driven by economics and meeting some of the conditions listed below. Our company customizes different kinds of closed die forging products,for instance,drive and axle components for the commercial automotive industry,drilling attachment for mining technology,forged fittings for oil and gas industry,as well as other complex geometrical structures for construction&agricultural machinery,offshore industry,aeroplane industry,ect. Wide range closed die forgings with superior quality and reasonable price from our company bring us an excellent reputation all over the world,so we are now growing fastly and exporting products at an increased capacity.The use of high-grade steels means that our products offer a particularly long working life. 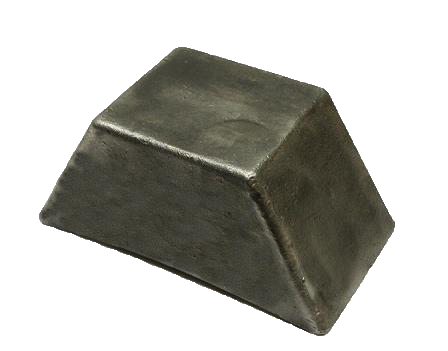 According to the advantages of closed die forging,it has become one of the main metal forming processes in modern manufacturing.For its wide range of material specifications and shapes,closed die forging can be useful for lots of metal components,such as componets for aeroplane,cars and heavy trucks,shipbuilding,ect. 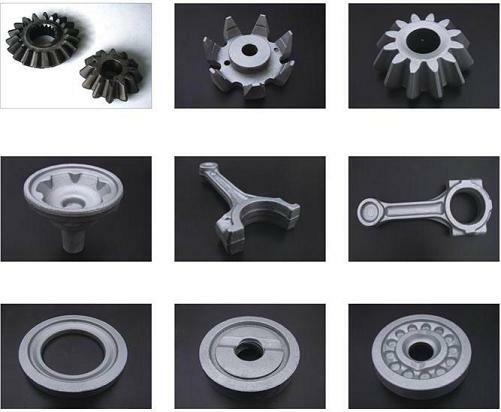 With the characteristics of closed die forging,we can make precision components with different wall thickness,complex shapes,narrow tolerance.And we are all equiped with full range of machining equipments,so machining is also feasible in our company.Maybe sometimes you could also consider casting process instead,but by comparison,there are both price advantages and quality advantages over casting,we will no need to worry about production defect. *After heating by medium frequency furnace,steel billets will be placed between upper and lower dies and forged in several times at high speed,so that the shape will be deformed quickly.Such press process will make internal grain flow and increase the tightness and strength of products. *It is no scientific to say closed die forging is expensive for its high tooling cost.Tooling cost of closed die forging is actually higher than that of investment casting for its high die material cost and complex processing process.But for large production runs,we must say it is more cost-effective. 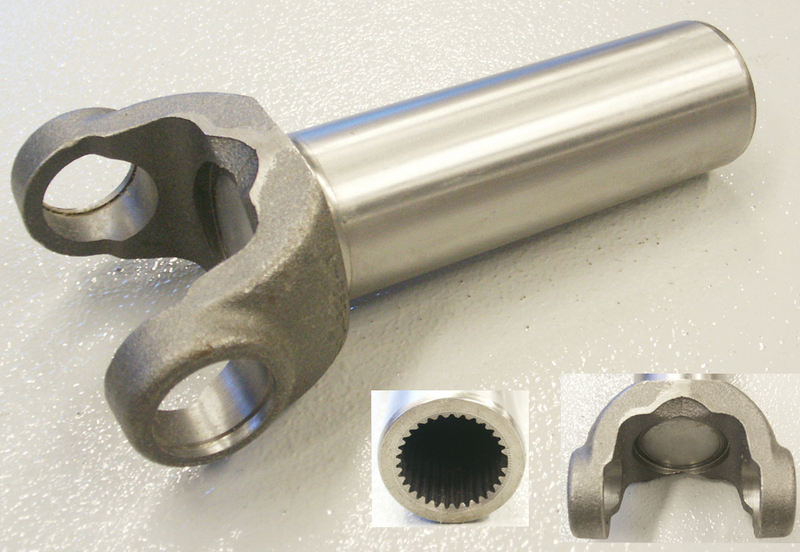 Near net shape manufacturing technologies produce components that are close to the finished size and shape,requiring a minimal amount of finishing process such as machining.Closed die forging is such a near net shape forging process that requires less or no machining.It will be helpful for us to save machining cost. 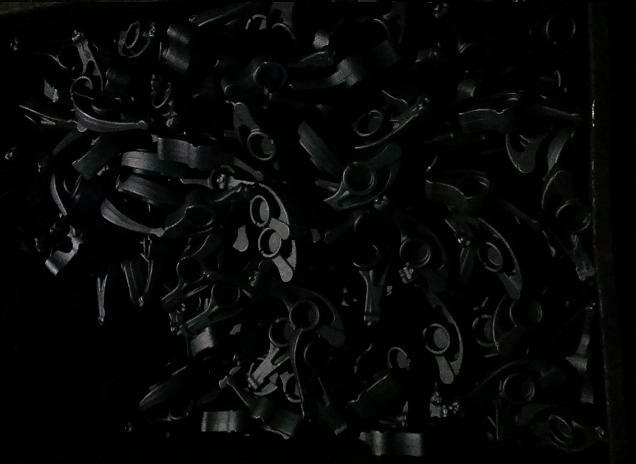 *Compared to machining process,closed die forging is a precision forging process with flash,so the only waste of material is just the flash section.We could also use machining to replace closed die forging process sometimes,but as the desired shape by total machining has be reached by machining equipments,so much of material will be wasted. Closed die forging is also named as impression die forging.In impression-die work metal is placed between upper and lower dies that attached to the anvil.Usually the hammer die is shaped as well.The hammer is then dropped on the workpiece so that the metal flows and fills the die cavities.The hammer is generally working on the workpiece at the speed of milliseconds.Depending on the size and complexity of the part the hammer may be dropped several times in quick succession.Excess metal is squeezed out of the die cavities,we call this flash.The flash cools more rapidly than the rest of the material;this cool metal is stronger than the metal in the die so it helps prevent more flash from forming.This also forces the metal to completely fill the die cavity.After forging,the flash is removed by punching machine(Of course,trimming die will also first made together with forging dies). Why can Closed Die Forging Produce the Strongest Steel Parts? 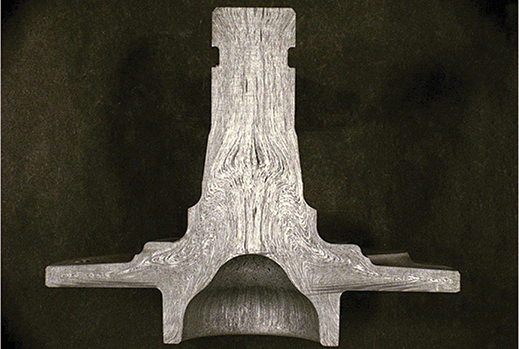 The techniques of closed die forging are capable of achieving some of the strongest metal products when compared to other manufacturing processes.During the process of closed die forging,forging operations used can seal any cracks or empty spaces of the billet,therefore creating very strong metal parts.The typical method that can achieve this is known as closed die drop forging,which is when a plate of metal is placed between two dies,and then compressed under extreme pressure within the closed cavities to form the shape between the molds.The cavities restrict the flow of the metal inside the die (mold),and the metal will flow to fill the space within the cavity,resulting in the shape and dimensions of the mold design.Depending on the type of metal used,this process can be done while the metal is hot forging. The Closed Die Forging process forces the material to flow and fill the space in the mold also changes the grain structure of the metal while making the product very strong.The flow is controlled in the direction what will achieve the strongest results and best grain structure.The high pressures of the process condenses the individual grains of the metal,resulting in higher density of the material and stronger properties. Arrange a Visit to Drop Forging Company before Ordering? 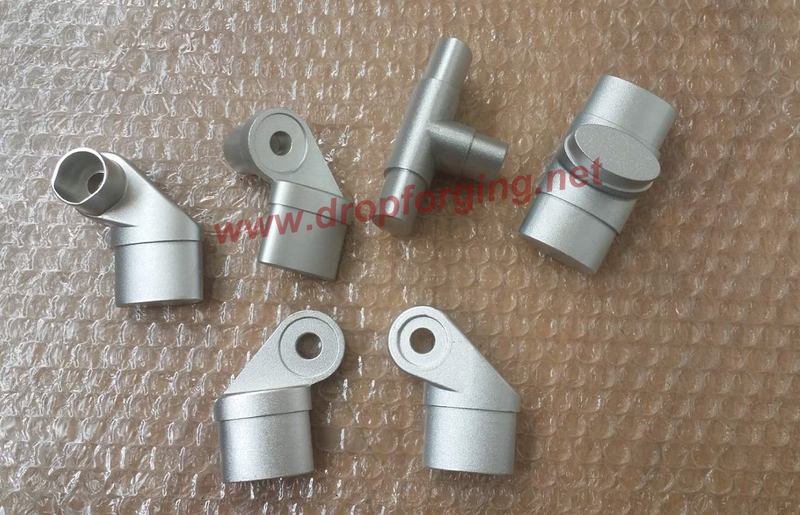 It is a custom process for manufacturing drop forgings,so there exsits difficulty to develop a new product.We all know that there are different requirements for different products,some just require drop forging only,some require machining to reach tighter tolerances and some require heat treatment......So it is really unknown that if the potential suppliers we choose are suitable.If buyers would like to custom cheap drop forgings from China with good quality,it is really necessary for them to arrange a visit before ordering. So when visiting,what should purchasers pay attention to? *What is the scale of the company? The scales of a forging company will decide its capability.A scaled drop forging company should have more than 80 staff.Like our company,there are about 150 staff,which is the largest drop forging company in Ningbo.It does not mean small scale drop forging company can not supply high quality products,at least its production ability is limited,and we can not say the lead time is ensured. 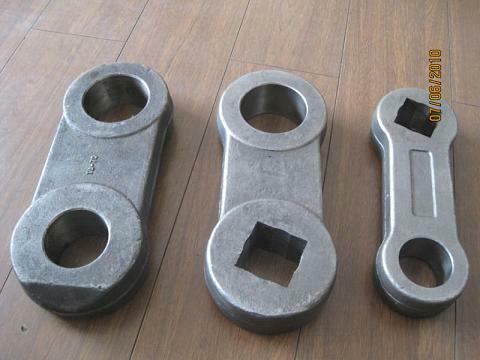 In recent years,more and more companies are used to manufacturing drop forgings from China.Then why do they like to do that?The most attractive point is that they can buy high quality production with low price.Normally,it is about 50%-60% cheaper to custom drop forging productions from Chinese drop forging companies than that of developed countries.Nowadays,for the improving of drop forging process,customers do not need to worry about quality problem.Take our company for example,to meet customers'demands of drop forging products in all applications,we are now equiped with ISO9001:2008,TS16949,API certifications.And we could not only supply drop forging blanks,but also machining can be provided also,so that we could custom finished drop forging products to our customers. 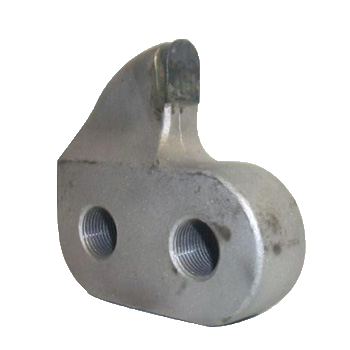 Steering knuckle is the safety component of a car.It may cause heavy traffic accidents if there is any quality problem.The geometry of automobile steering knuckle is complex,belongs to compound type of forgings,consists of the fork,plate,bar of three parts.So the forging technology need to aspire to forming characteristics of three kinds of forgings.Steering knuckle is regards as the most complex forging parts in forging industry. 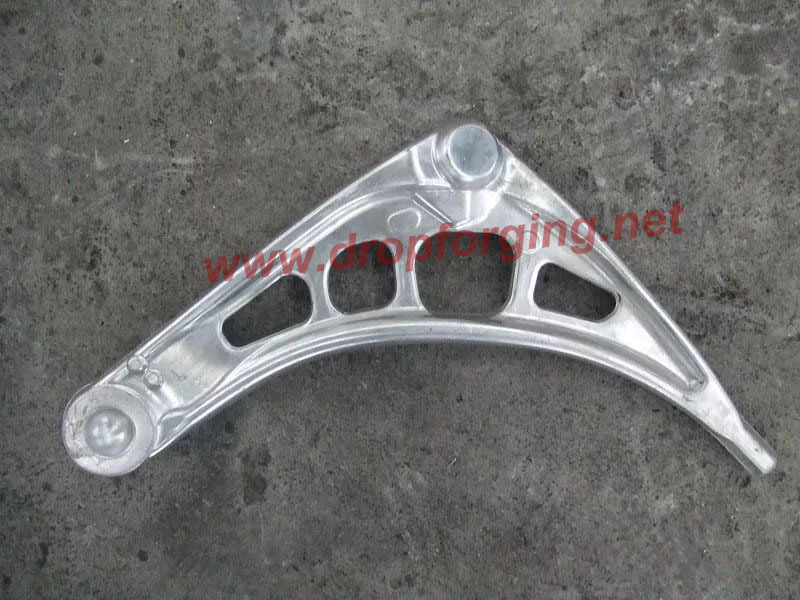 Now there are some car steering knuckle also increased the steering arm and tie rod arm,whose structure is more complex,the current steering knuckle is widely used in the van and light vehicle,also have individual heavy vehicles use this structure of steering knuckle.As shown is a light vehicle steering knuckle,its structure is very special,and its forging is difficult.Steering knuckle forging in the part was made by use of 3t,5t,10t die forging hammer,13 tm double-action hammer and some other forging equipments,but the production efficiency is low and product quality is poor.In recent years,auto production every year increases by double-digit growth,and the demand of steering knuckle is increasing rapidly,the old mode of production has not suitable for the needs of the modernization and mass production. Hot die forging press is a special forging equipment of batch production and mass production of black and non-ferrous metals that are used for closed die forging.It is widely used in automotive industry,agricultural machinery,bearings,valves,engineering machinery,hardware tools,oil industry and the forging of the defense industry production.Can complete closed die forging forming of metal parts like blade,horns,gears,chain plate,valves,wrench,bulldozer,connecting rod,ect. There are mainly three series of hot die forging presses,namely NSP,NMP and NKP.Of course,there are also some auxiliary forging equipments,such as roll forging machine,trimming machine,heating machine,ect. 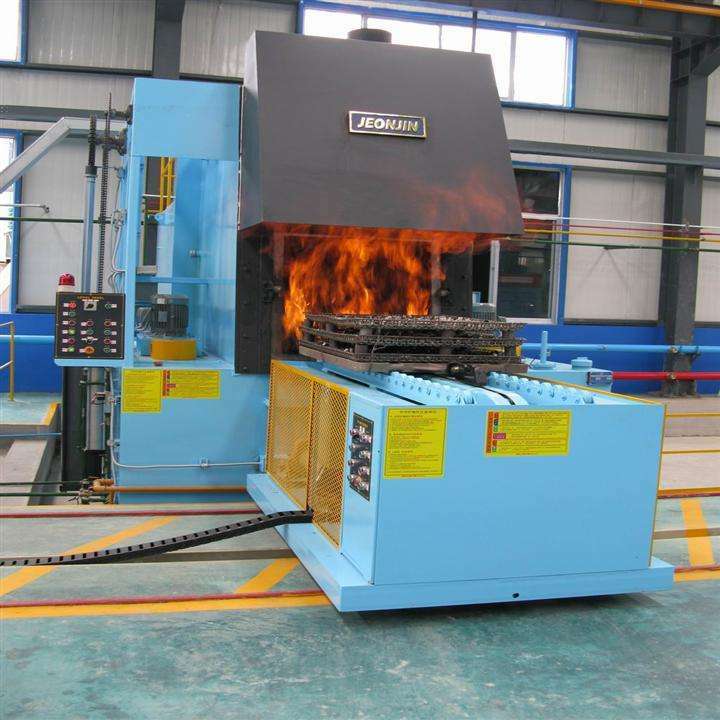 Hot die forging presses have advantages of high efficiency,simple operation,convenient maintenance,and suitable for automation forging assembly line.High blow speed,mould thermal contact time is short,and forging dies service life is long.Using upper and lower design will make draft angle decreasing and forging material saving.High resistance to tilt rate, lead to high precision guide rail and high quality steel forgings.PLC control,multiple safety operating circuit system,can ensure the operator safety.Left and right sides of the body is equipped with the work window,so that forgings delivery is convenient.Special card die liberation device,make release of dies rapidly,and the operation is simple.Reliable centralized lubrication system and manually add lubrication system,can effectively reduce the friction loss.Equipped with advanced international tonnage meter,can visual display forging force,and set the overload alarm. around the word constantly look for a better production method to achieve the objectives and requirements of the auto parts buyers. 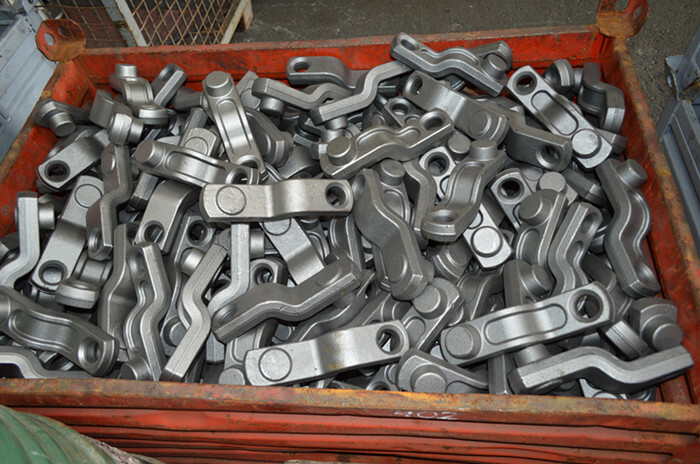 Forged connecting rods are regarded as the quality standards of internal combustion engine to use for decades.Over the years,production methods of connecting rods are constantly changed,includingforging hammer forging,press forging,metal powder forging and casting.In the early years of auto industry development,forging hammer forging is considered to be one of the best forging method.However,in the middle of the twentieth century,due to the higher requirements for quality and tolerance,the forging method must be changed,so manufacturers began to use mechanical press to replace forging hammer.The most effective way to reduce the manufacturing cost is to improve the material utilization.Increasingly stringent requirements for weight and size tolerance promotes the use of powder forging method.Another advantage in addtion to tolerance is that we could forge connecting rod cover toegther with connecting rod,and can open the cover from connecting rod,thus manufacturing cost can be saved.In the late twentieth century, forging method developed into "open" forged steel connecting rods(Why use steel for drop forged connecting rods in automotive cylinder engine? 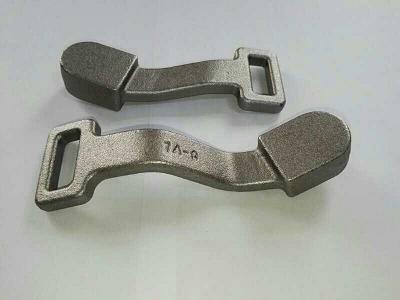 ),it is also one of the strengths of the powder forging.The strength of forged steel connecting rod is higher than powder metallurgy rod.Increase as the engine compression ratio,compared with the powder forging connecting rod(wrought vs powder forged connecting rods),high strength of forged steel connecting rod becomes more satisfactory,this forging method can meet the both strict requirements of weight and size tolerance. There are different types of forging processes,today our discussing topic is drop forging design.Before drop forging production,the engineering design team will first finalise the geometry,dimension,tolerance and material requirement(normally used material is drop forged steel) for the desired component.This is based on future application of the products,including the intended performance of the part.The typical output is a machine drawing of the final required part;which include post drop forging processings such as machining,tolerance and surface finish requirements.The drop forging drawing of the considered component is shown in Fig.1.1. And a 3D model displaying different views is shown in Fig.1.2. The first step for a production engineer is to convert the machine drawing into drop forging part drawing.Understanding of the function of actual part in service should be considered as a prerequisite to efficiently deal with this conversion phase.This understanding also helps to improve the decision making ability for the subsequent design stages.The selected component is a part of the universal joint used in propeller shaft for heavy commercial vehicle application.The component is known as “Flanged Yoke” in automotive terminology. 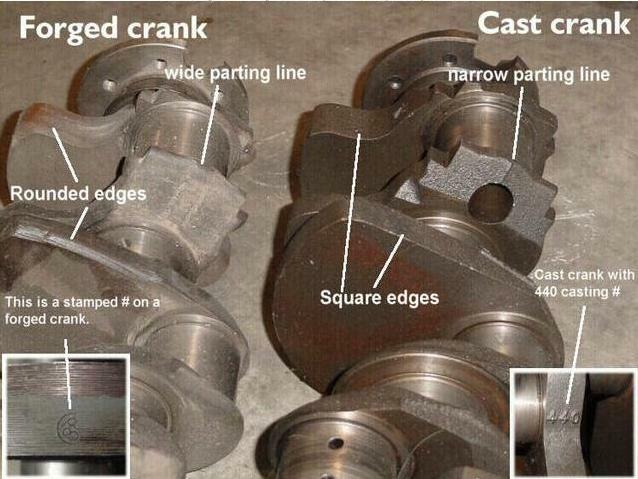 It is mostly subjected to torsional loadings;as the whole propeller shaft is designed to efficiently transmit the engine torque to the rear axle. Because close tolerances achieved in basic closed die forging process,further machining processing can be reduced or avoided.Thus,productivity is improved with a overall cost reduction. 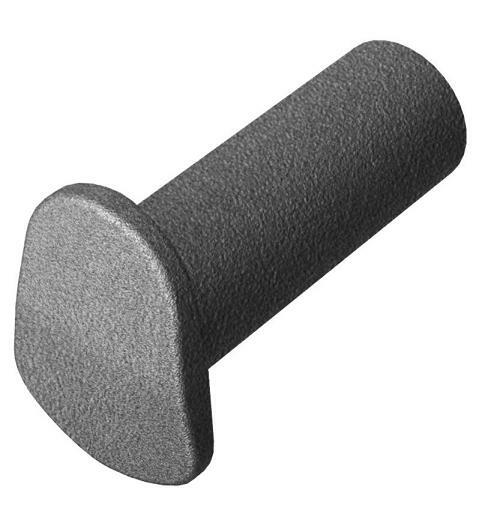 As billtes are impressed by dies,inside grain flow will improve properties such as strength,ductility,impact resistance,fatigue resistance,ect. Closed die forging is one of the drop forging processes(another is open die forging),which is mainly for precion small parts using forging technology to achieve better surface finish and performance.In fact,the original name of closed die drop forging is impression die forging,closed die forging is just compared to open die forging.We call this process impression die forging because billets are impressed on the dies to get deformed to create a new part. In closed die drop forging,two halves of dies are pressed together at a high pressure to shape a metal bar into desired dimensions.This is also a closed process as the dies completely closed together in times to form a part.Most commonly,this form of die forging is used to create 3D metal shapes, such as solid metal parts and other metal pieces that have a solid design and 3D shape. The metals most commonly used with this form of die forging include steel,aluminum,and titanium. 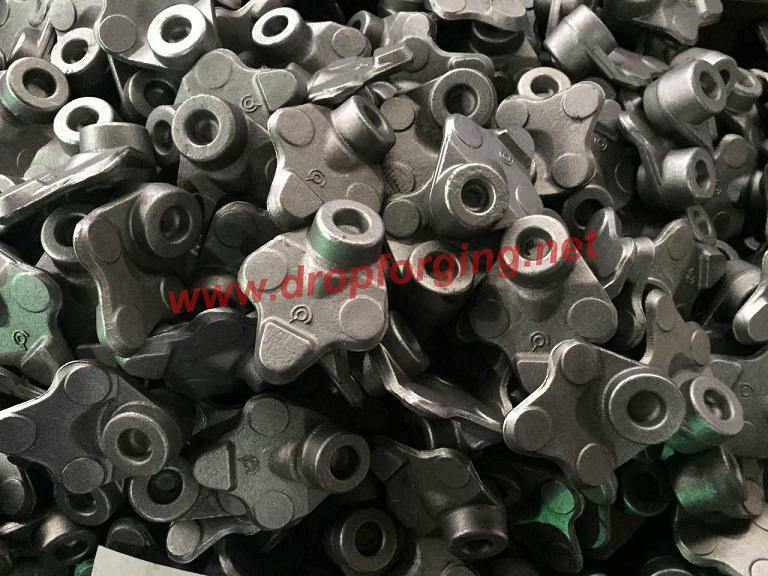 Drop forging products are served for a large number of industries,such as automotive,agricultural,mining,forestry,oilfield,ect.Almong all the metal materials,most popular material is drop forged steel.It is widely used because it is a very strong and stable metal that can withstand high temperature heating by drop forging machines,thus can be shaped.Heating the drop forged steel to a high temperature by our medium frequency furnace because under room temperature,the steel is solid and we have no way to make the billet shaped.Only reach a certain temperature can we change the structure.The heated malleability of the metal combined with the force of the hammer shoving the metal against the die usually makes shaping drop forged steel relatively easy.Because of this ease of shaping the sheets of metal can be processed into their required shapes pretty quickly. Request a Quote for Drop Forging? 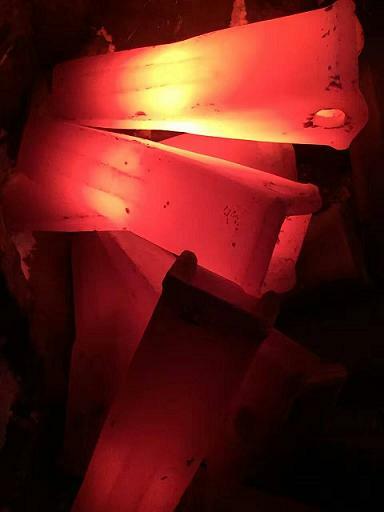 "Were looking for company to forge our PDR tool tips.Tools made from 4140 carbon steel.We need about 10" to 16" taper on one end,check our website out".This is a quote request for drop forging that was sent from one of our customers.From the requested information we know that the material is 4140,which is commonly used material in drop forging process.And the sizes of the drop forged tool tips are from 10" to 16",so we could judge that it is within our forging capacility,too large or too small is not available. 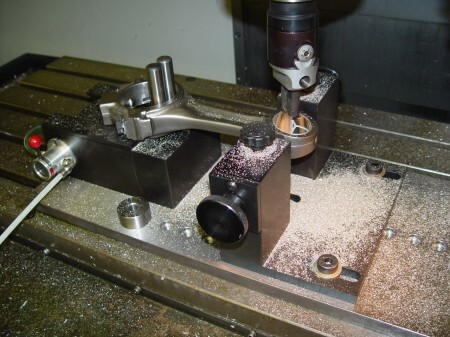 But to offer a quote completely,we still need to know if our customer could send us the detailed 2d drawing or sample.Since we could do cost estimation of the product correctly,and especially need to note if there is any machining requirements,as machining cost will be added for any machining job,although we have machining capability. The forging dies will decide the postion of parting line around the edges of drop forgings.So it is a important thing to determine the position of parting line.The choice of parting line will directly affect waste material,machining allowance.Designer should indicate the position of parting line in the forging drawing clearly.It is better that the parting line lies in one plane perpendicular to the axis of the die motion. It can be located such that one die half will be completely flat, and the line will surround the largest projected area of the piece. The angle of the surface at the parting line from the primary parting plane should not exceed 75°, in general, the shallower the angles,the better it will be. 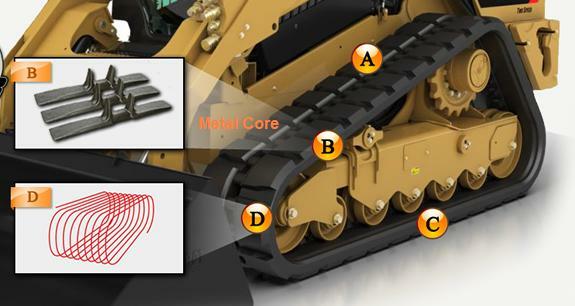 It is crucial for designer to select the parting line such that no undercuts are in either die impression,since the forging must be ejected out of the die after it is made.The parting line location can be changed to control the grain direction given the above recommendations are fulfilled. Forging is defined as a metal working process that shape workpiece into desired dimensions by compressive forces applied through the use of dies and tools.Forging process is operated by hammering or pressing the metal.It is one of the oldest known metalworking processes with its origin about some thousands of years ago.At first,forging was complicated by a smith using hammer and anvil.Using hammer and anvil is a crude form of forging.The smithy or forge has been improved to become a facility with engineered processes,production equipment,tooling,raw materials and products to meet the demands of modern industry. 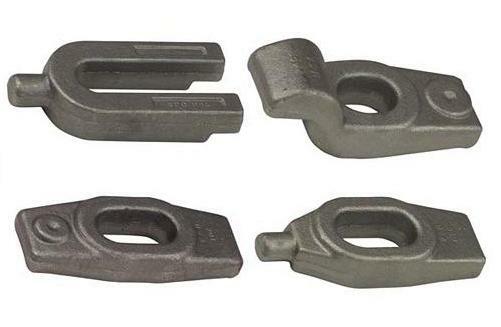 In nowadays,industrial forging is done either with presses or hammers powered by compressed air,electricity,hydraulics or steam.Some examples of products obtained by forging process are-crane hook,connecting rod of an IC engine,spanner,gear blanks,crown wheel,pinion etc. 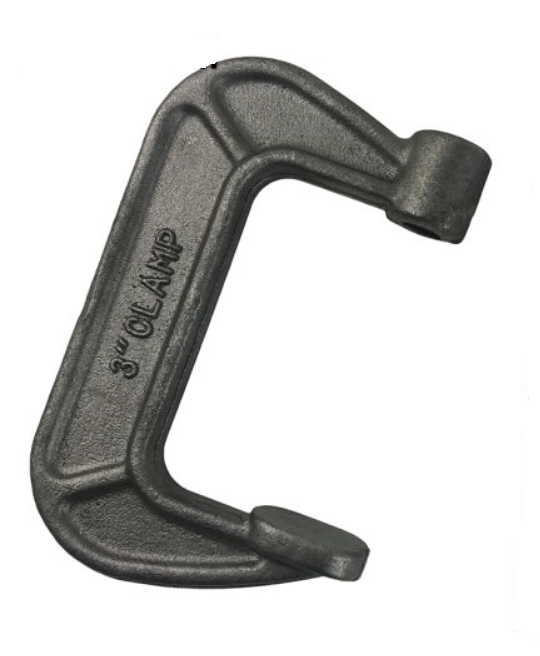 As a leading drop forging supplier in China,our company successfully achieved the ISO/TS 16949 certifications in 2014 by the joint efforts of all staff.We are now able to customize all kinds of automotive parts with our advanced drop forging process.Such forged automotive parts are like forged connecting rod,york ends,tie rod end,rocker arm,control arm,ect.These forged automotive parts are mainly exported to USA,Germany,Australia,UK,Canada for automotive manufacturers or auto parts dealers.Thanks to our high quality,impressive service and competitive price,we are always keep good business cooperation with our customers.